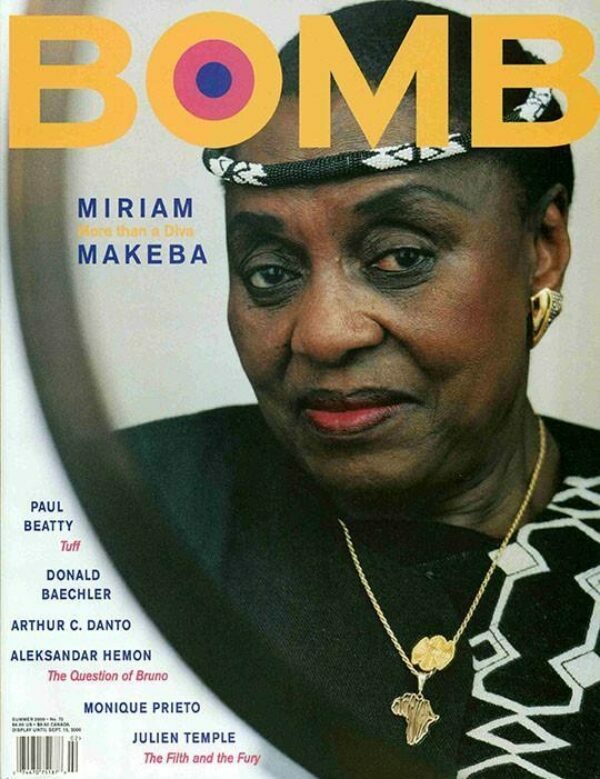 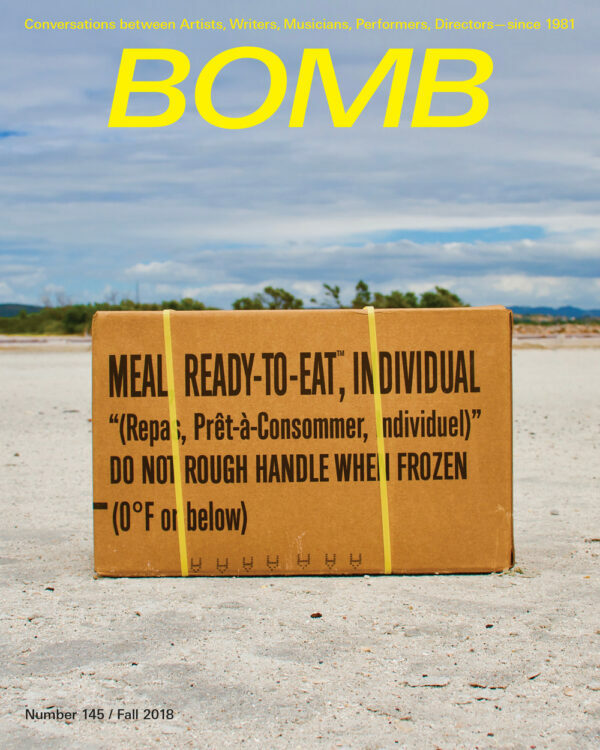 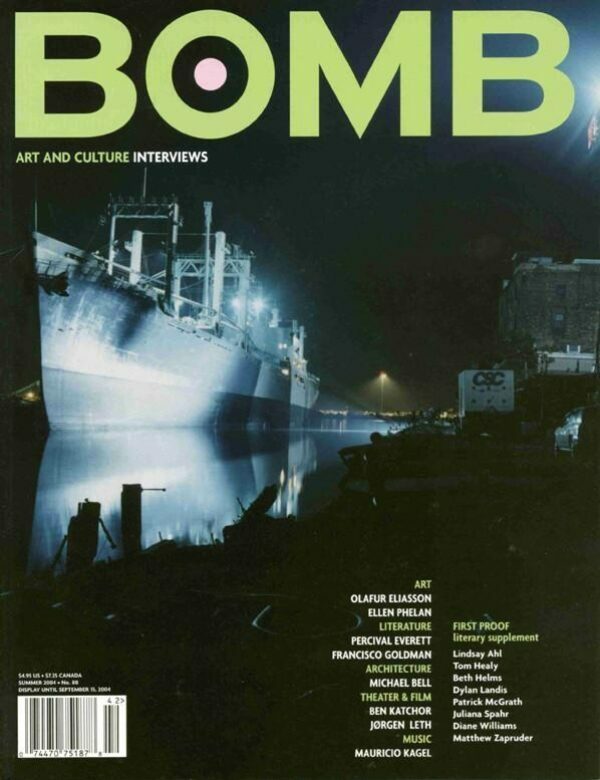 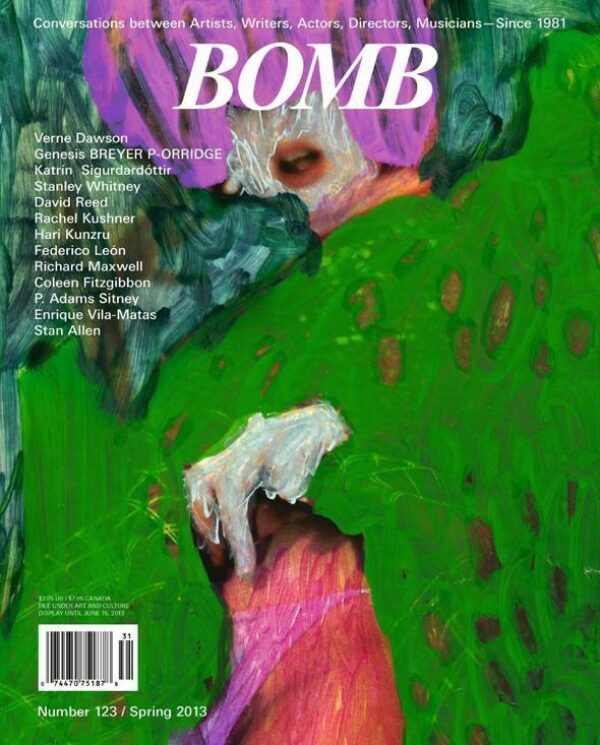 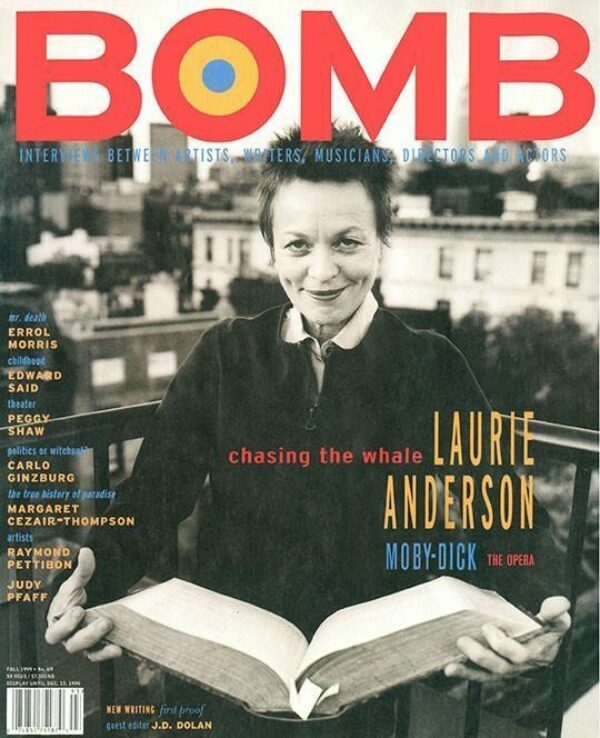 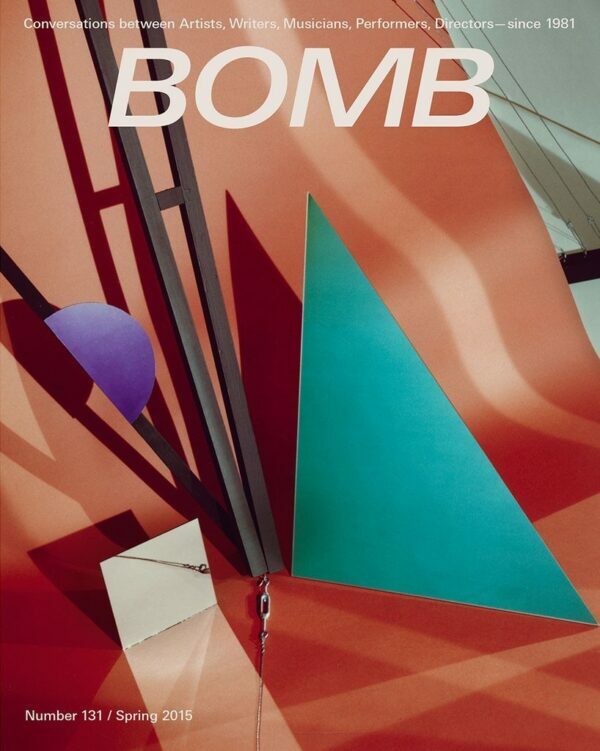 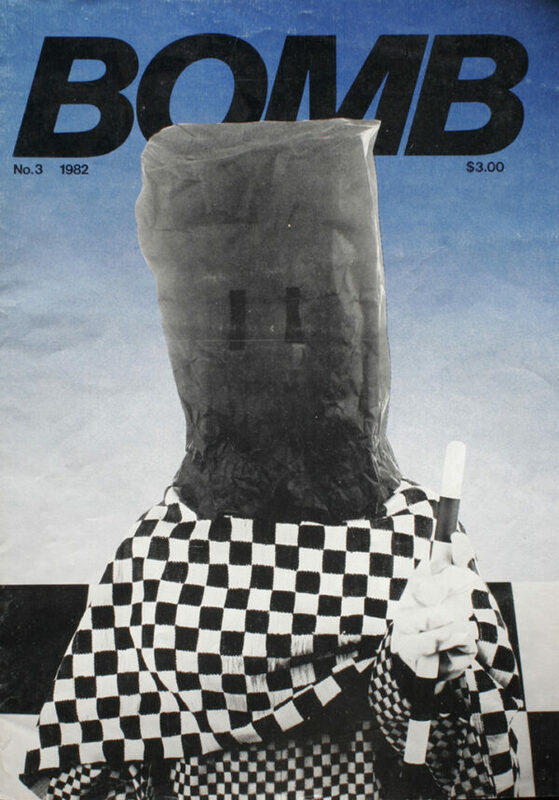 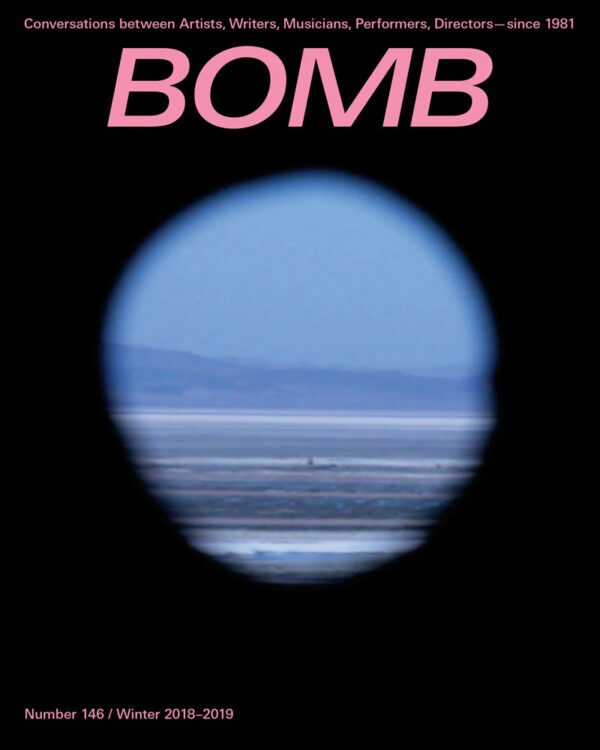 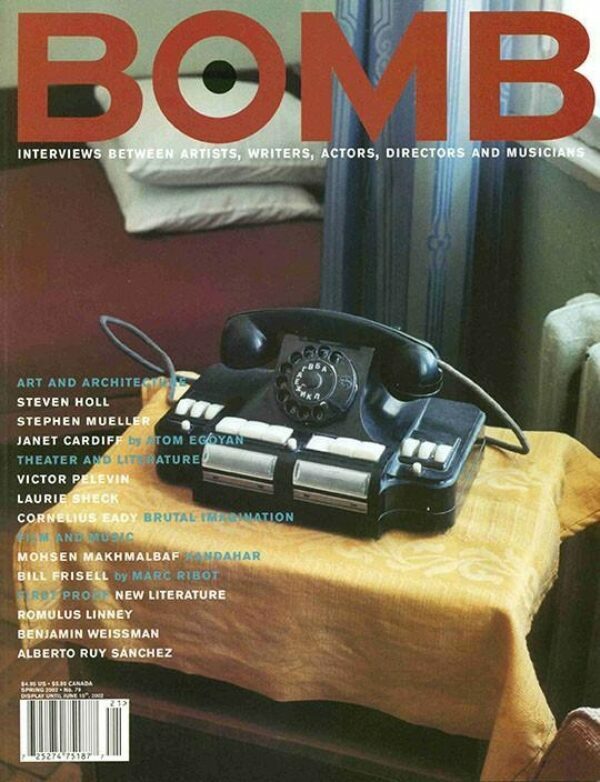 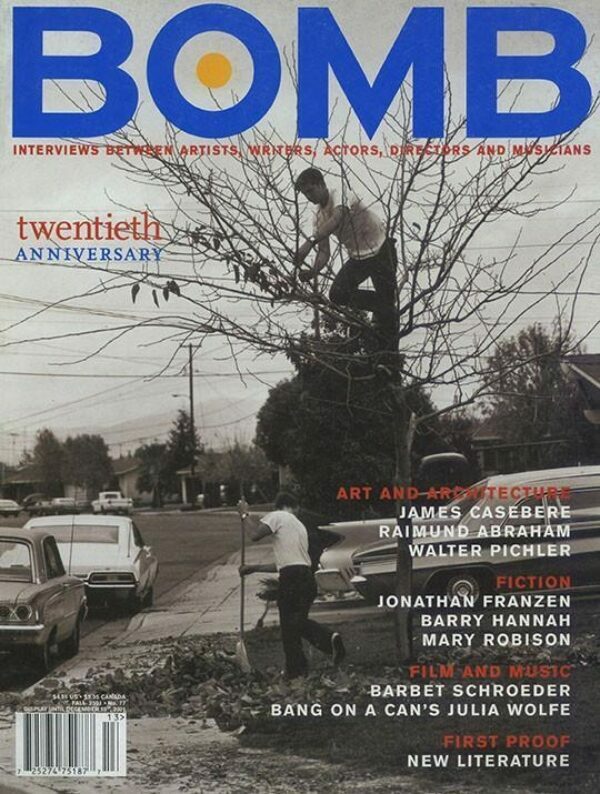 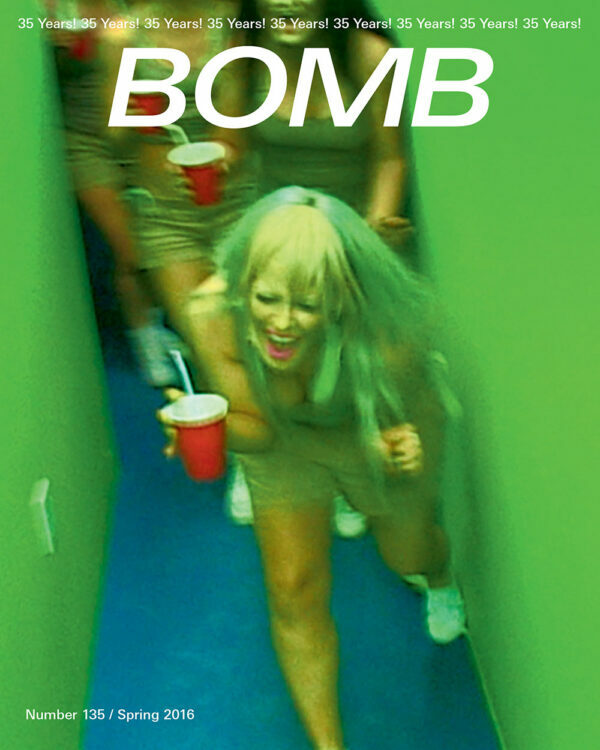 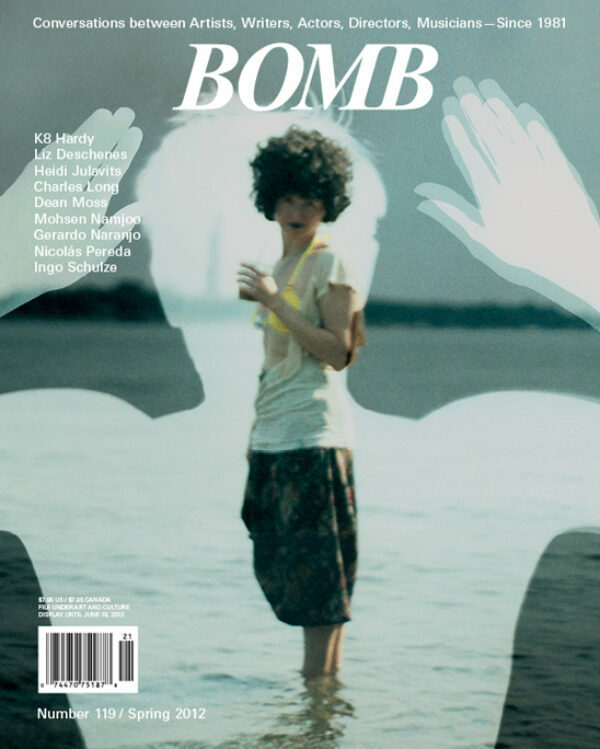 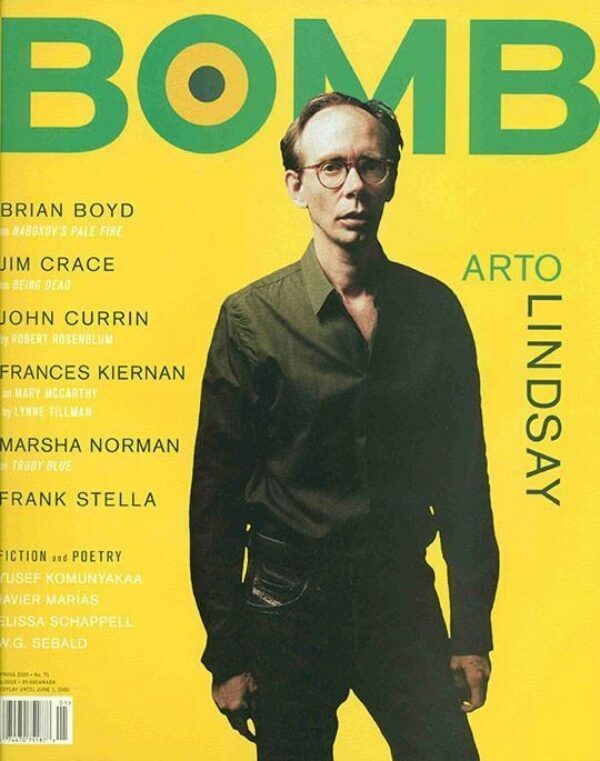 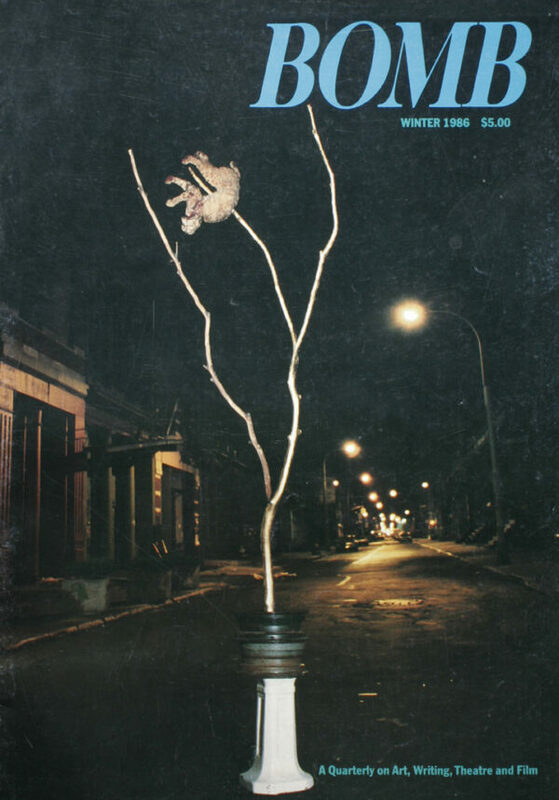 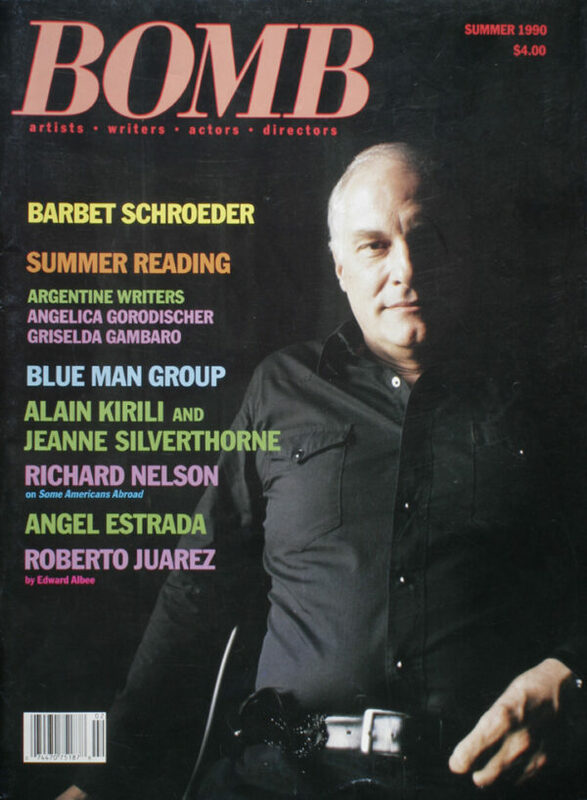 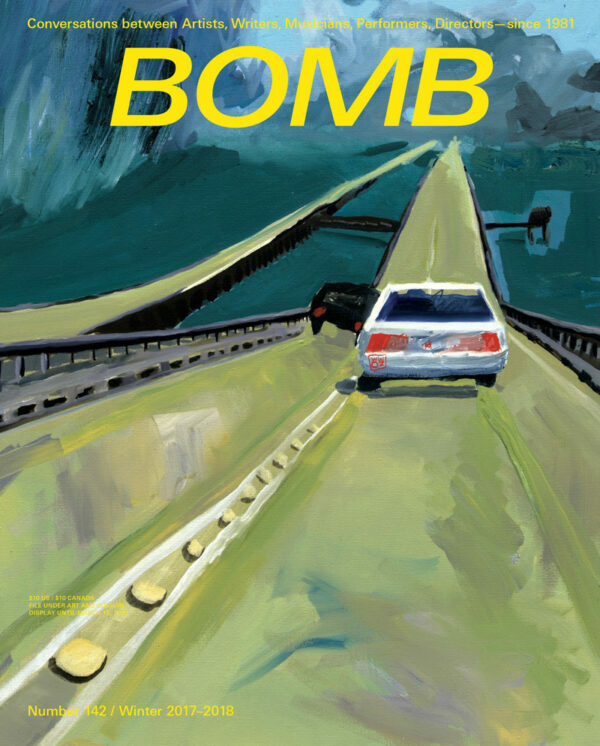 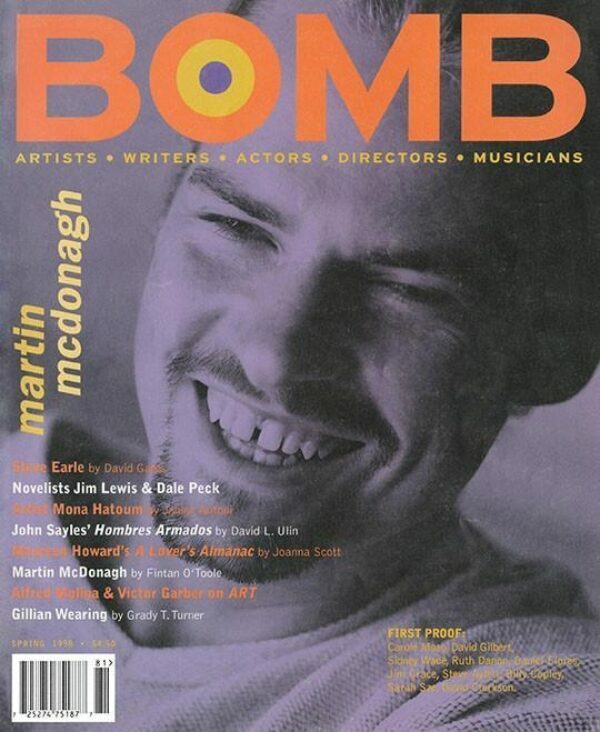 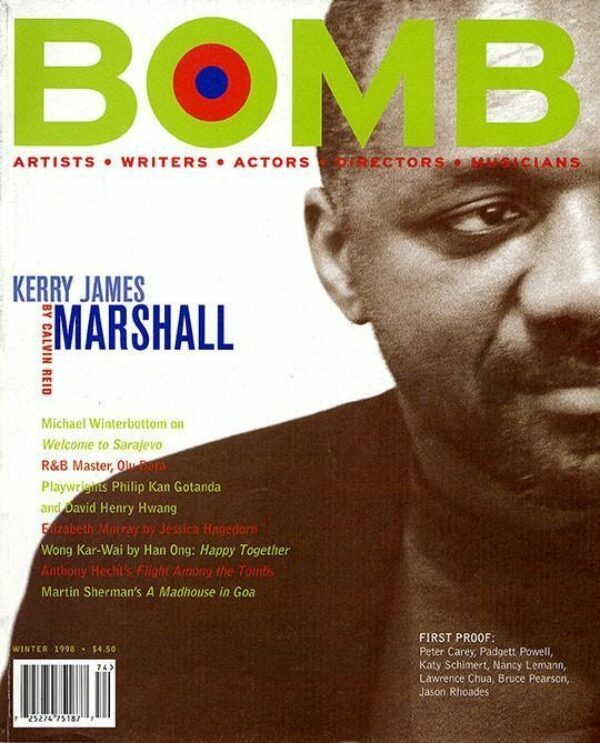 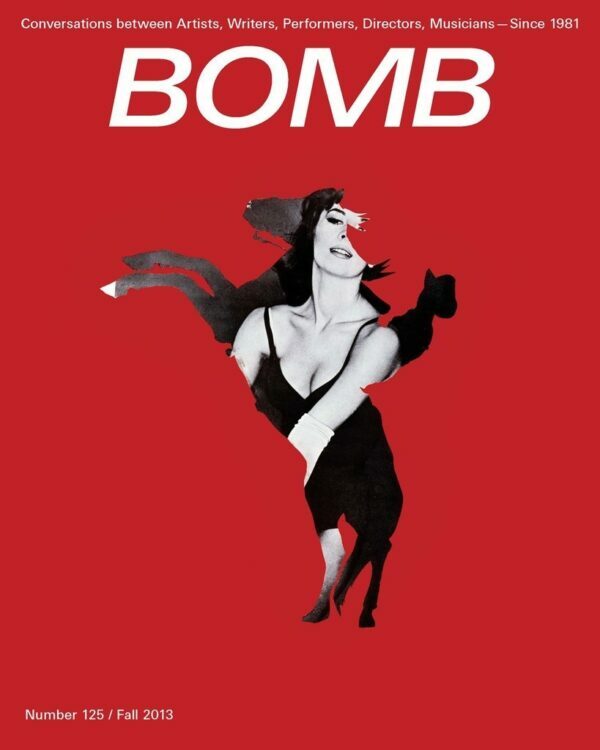 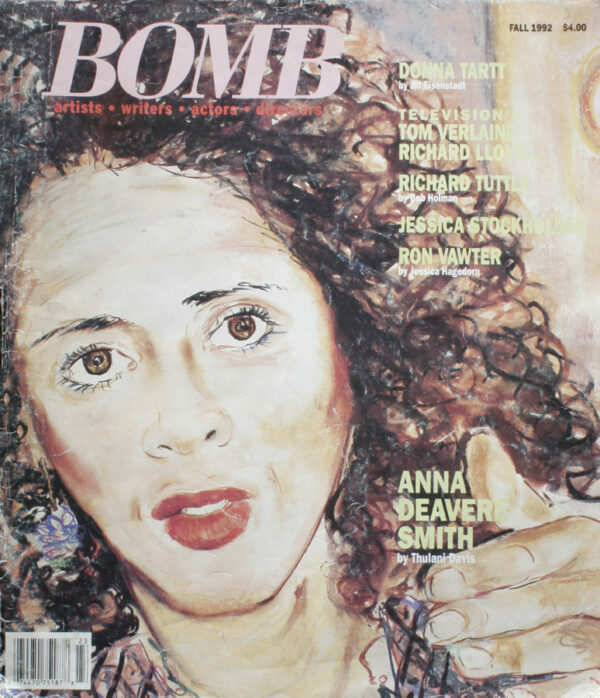 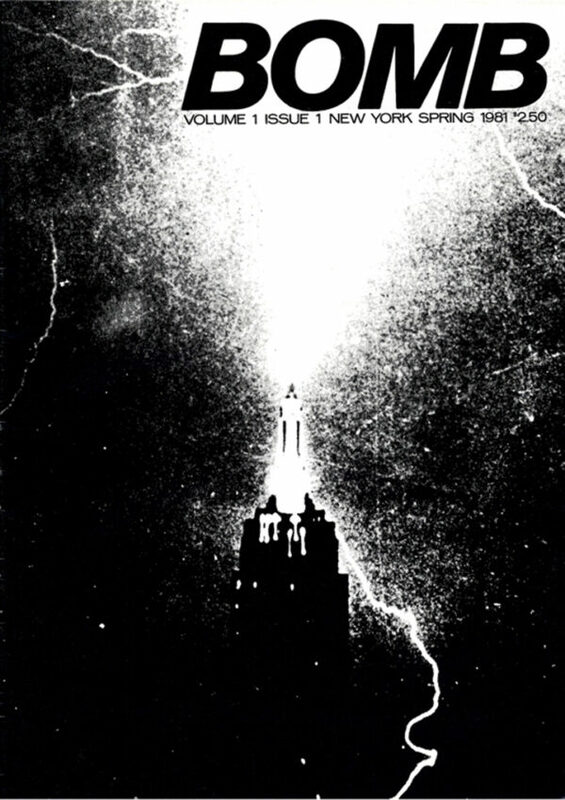 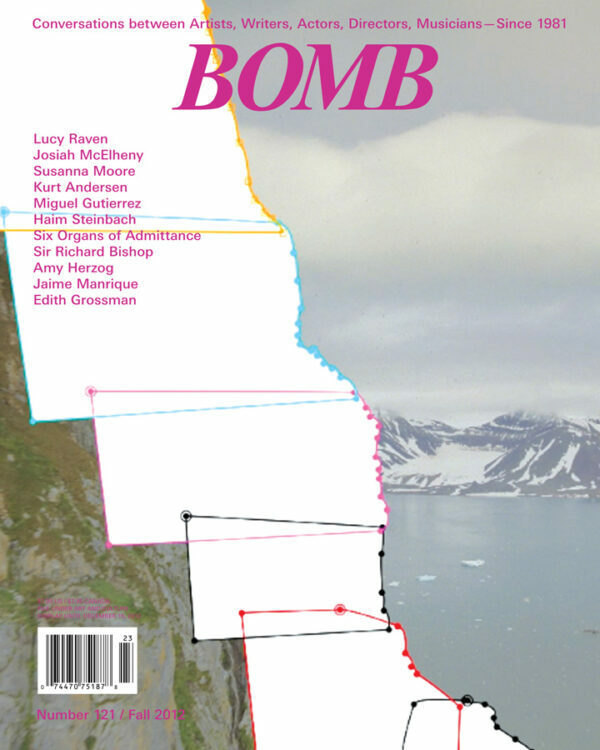 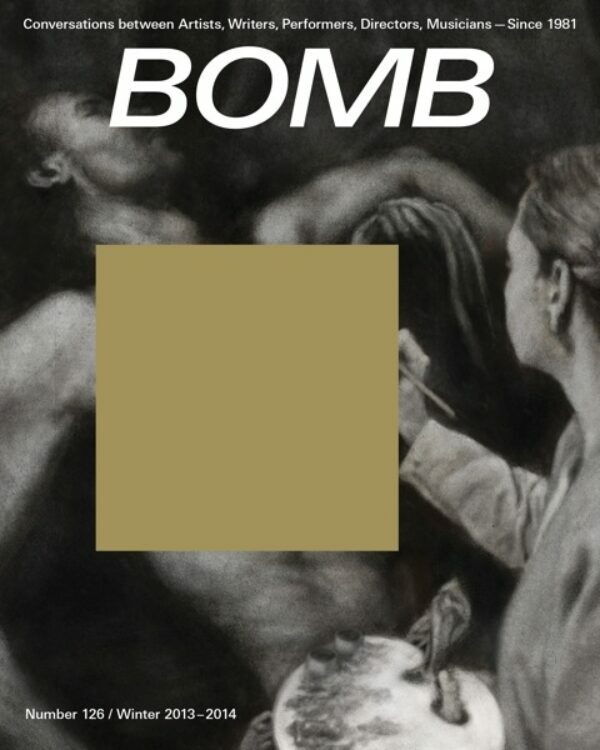 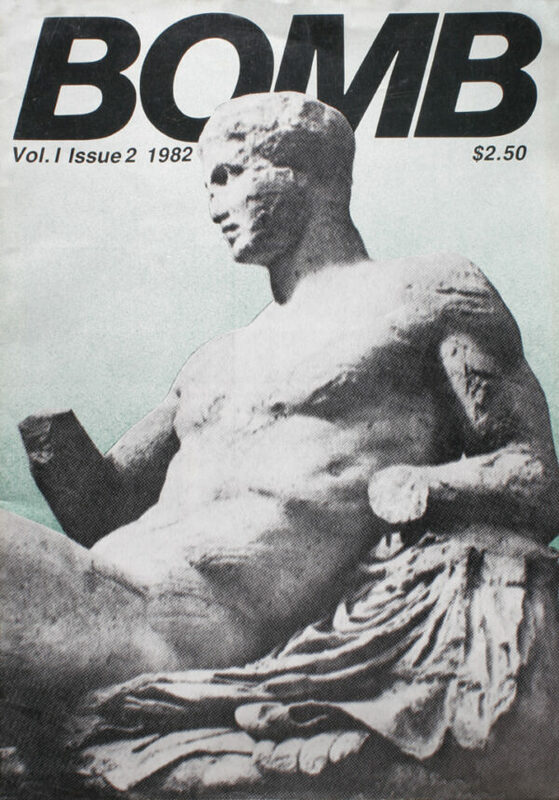 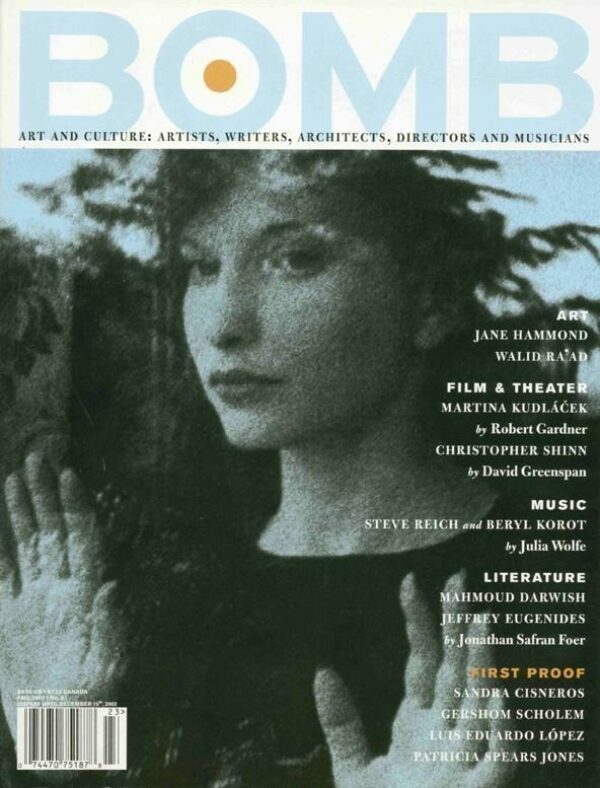 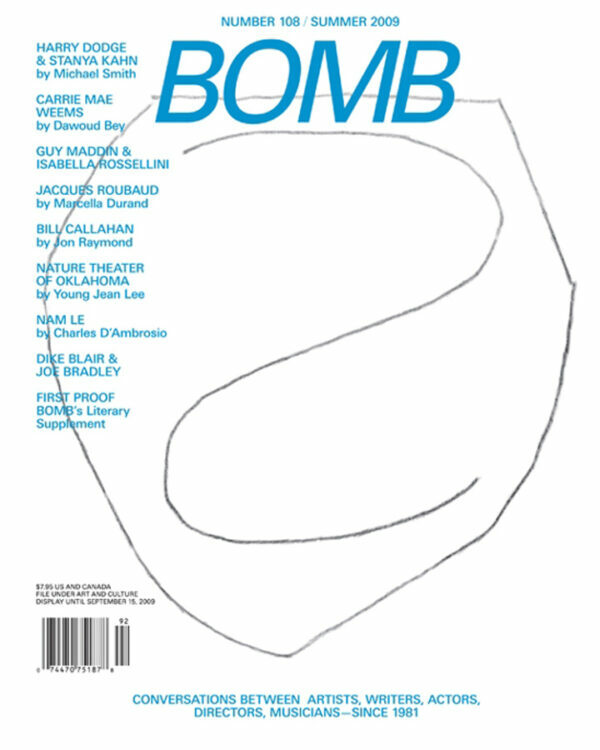 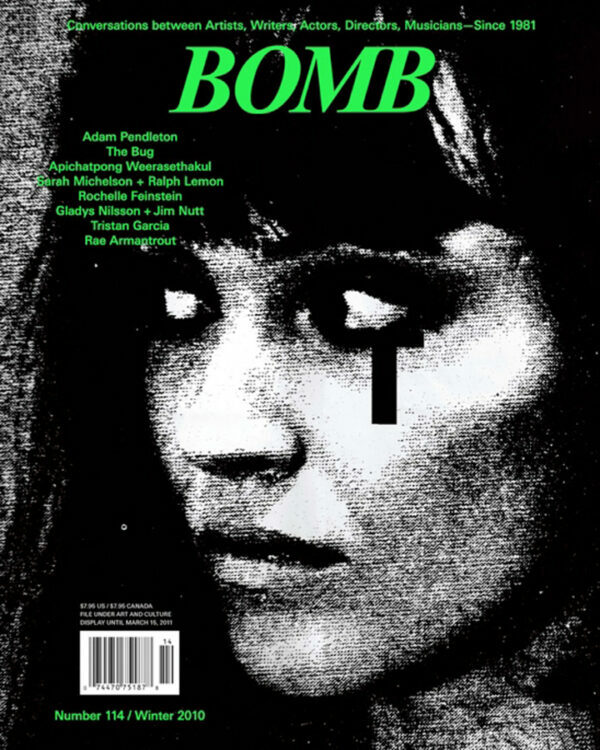 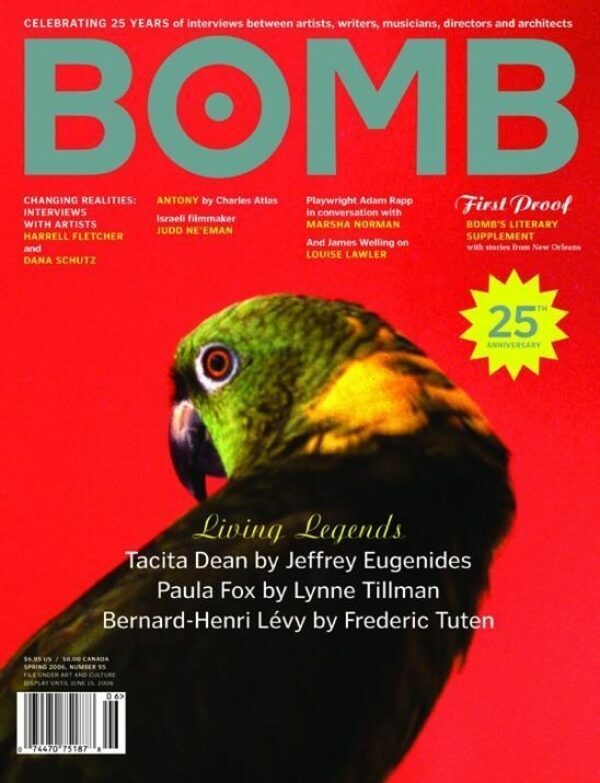 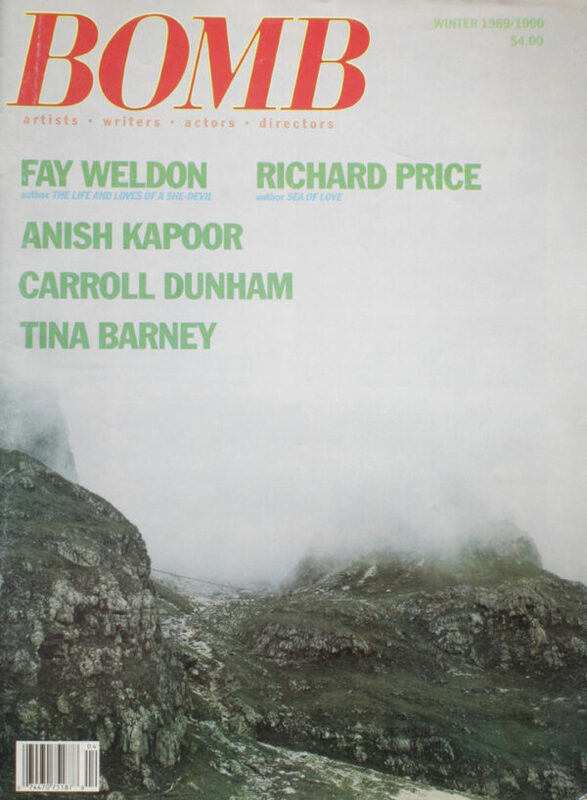 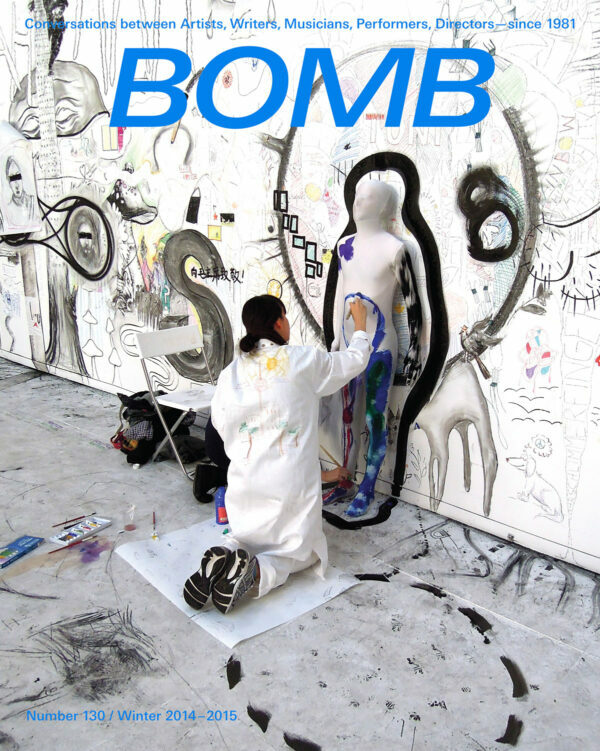 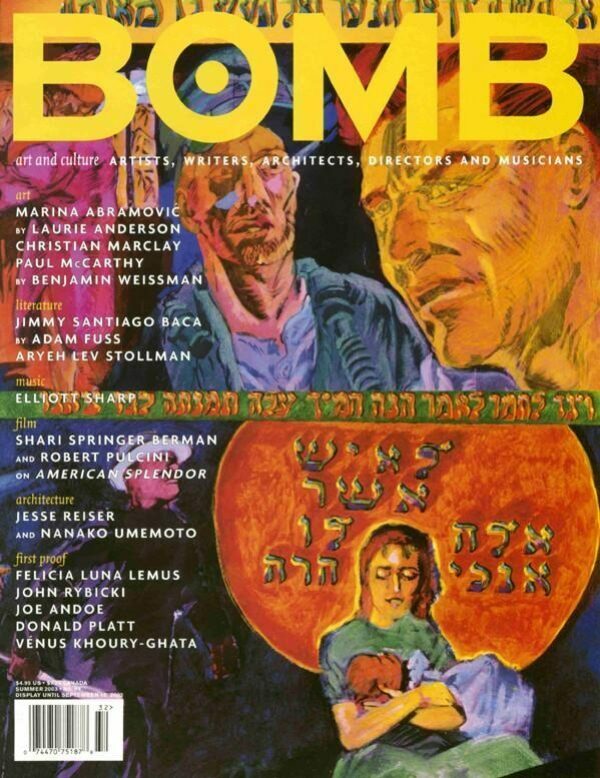 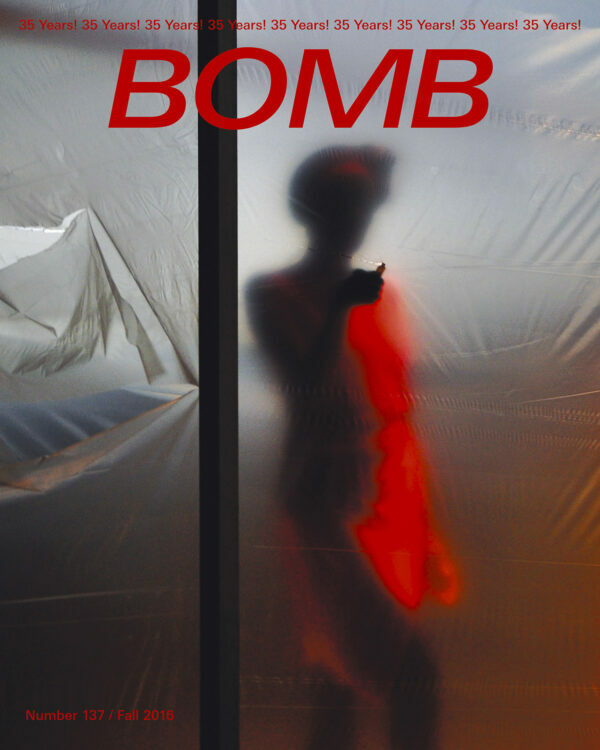 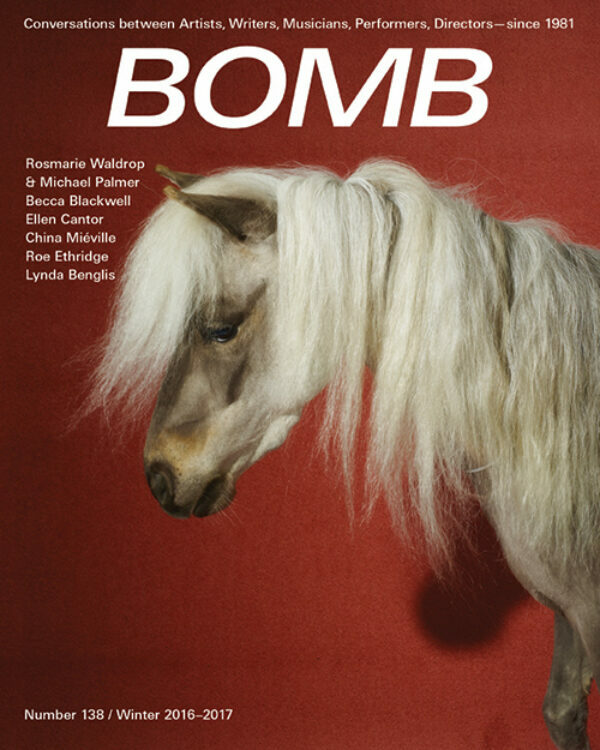 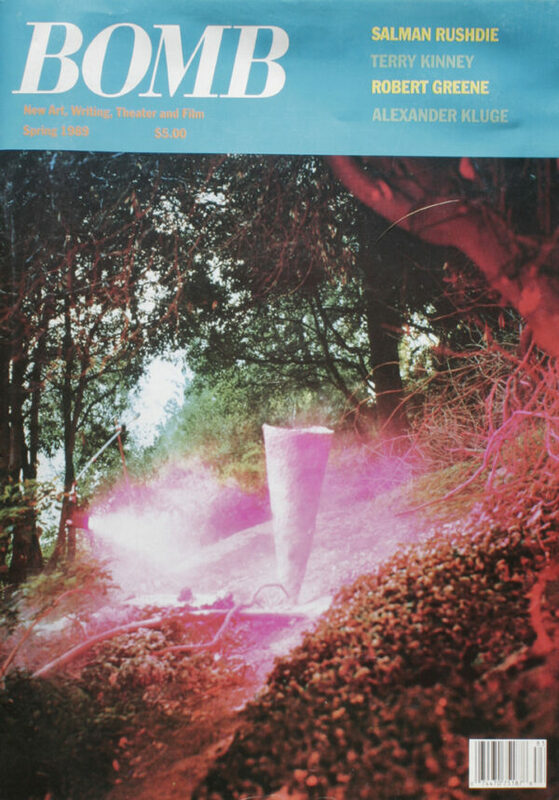 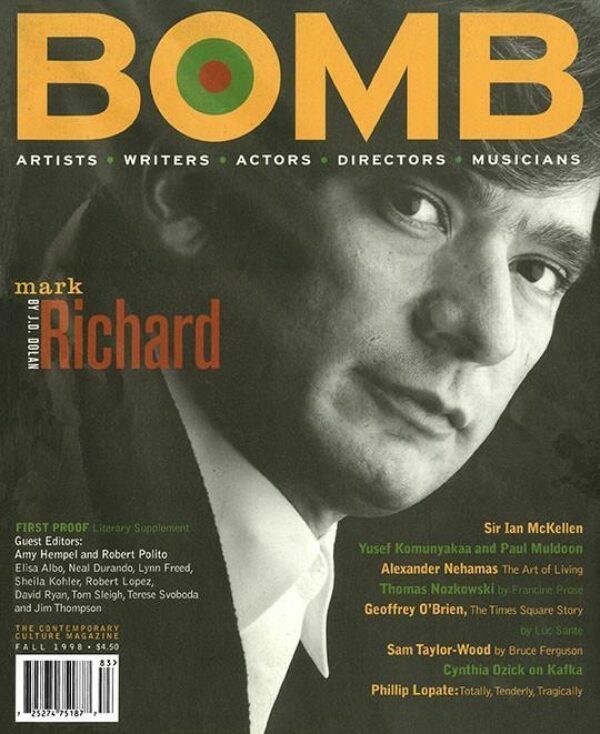 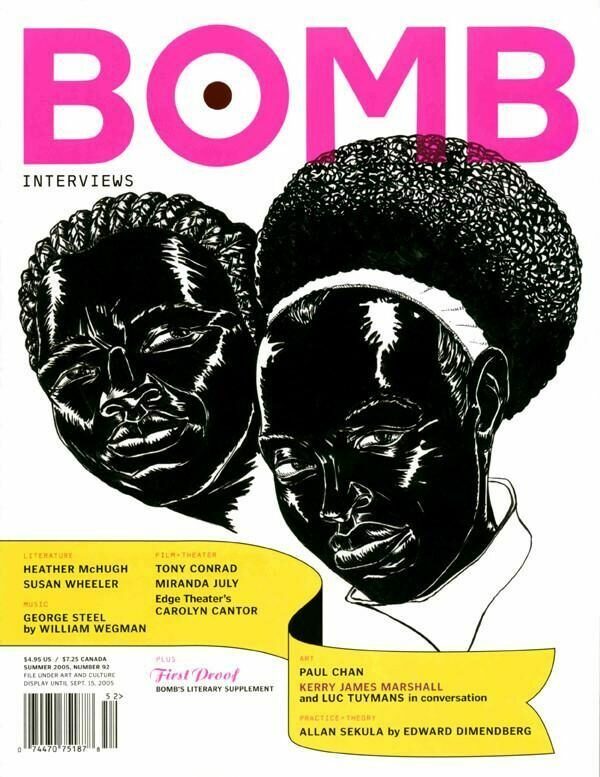 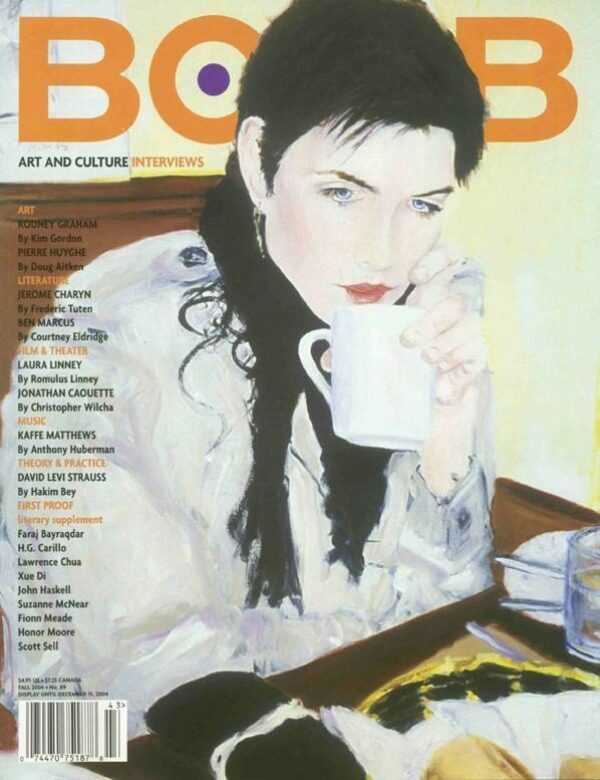 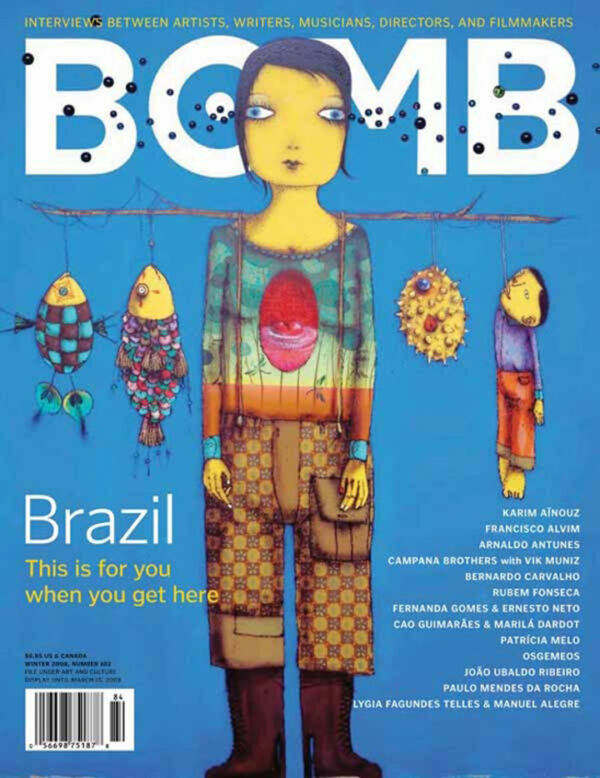 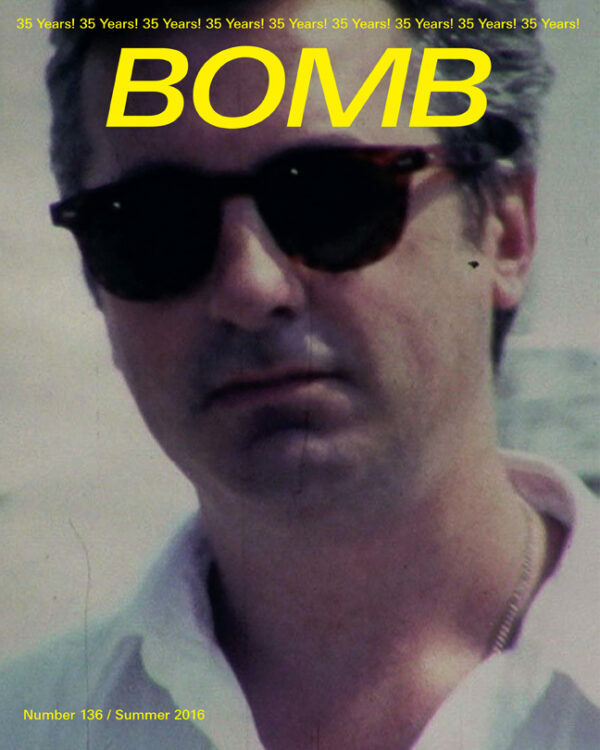 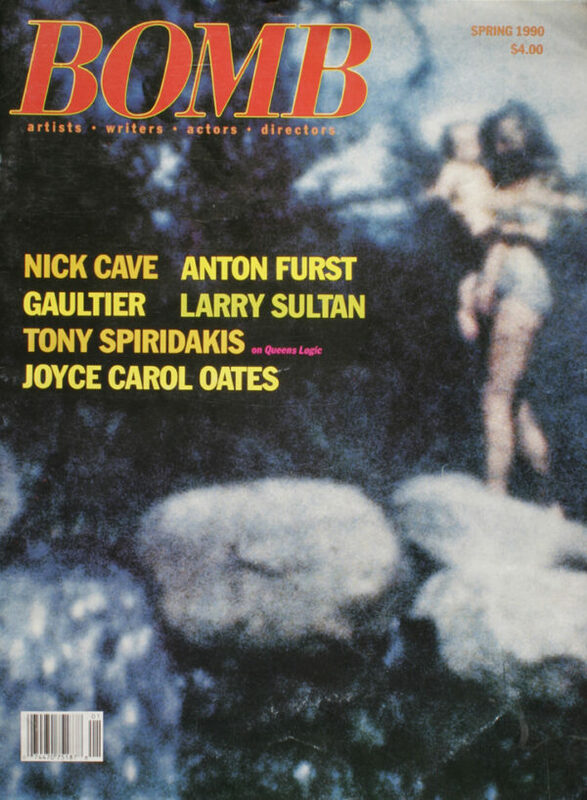 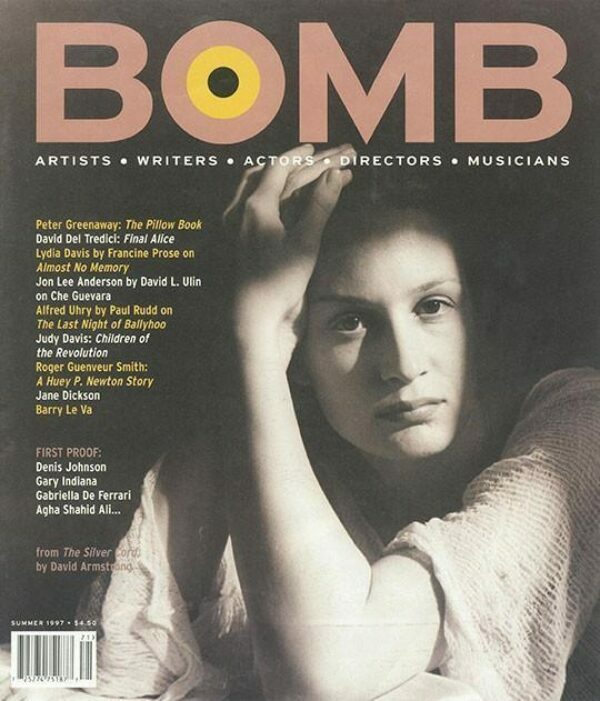 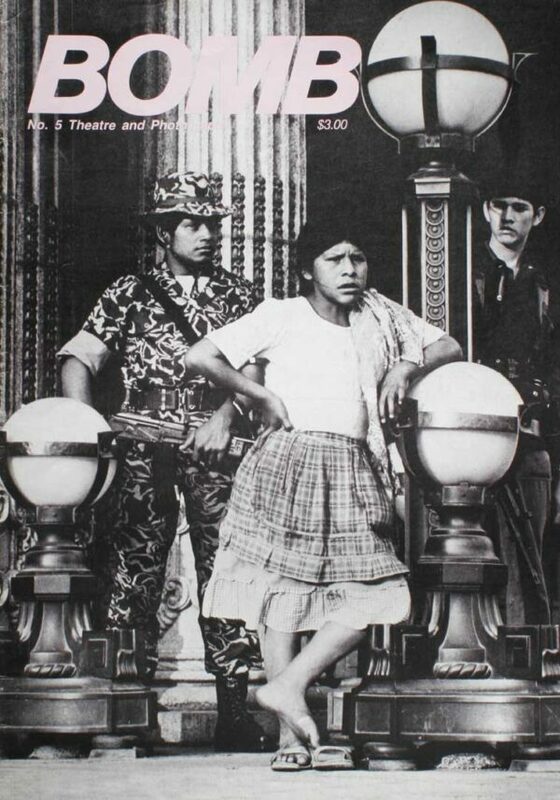 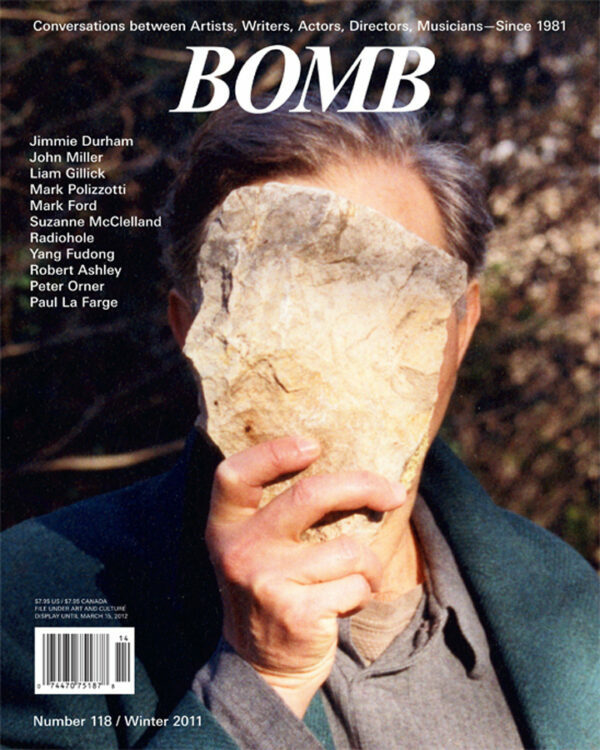 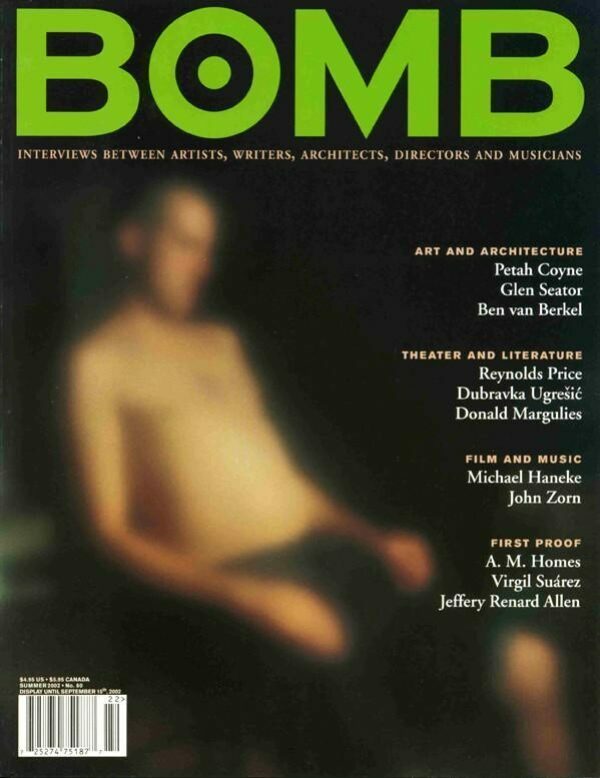 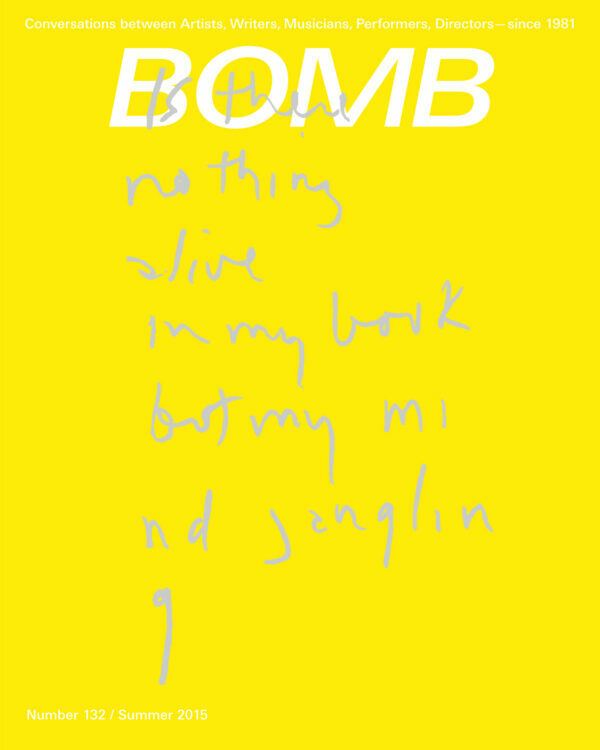 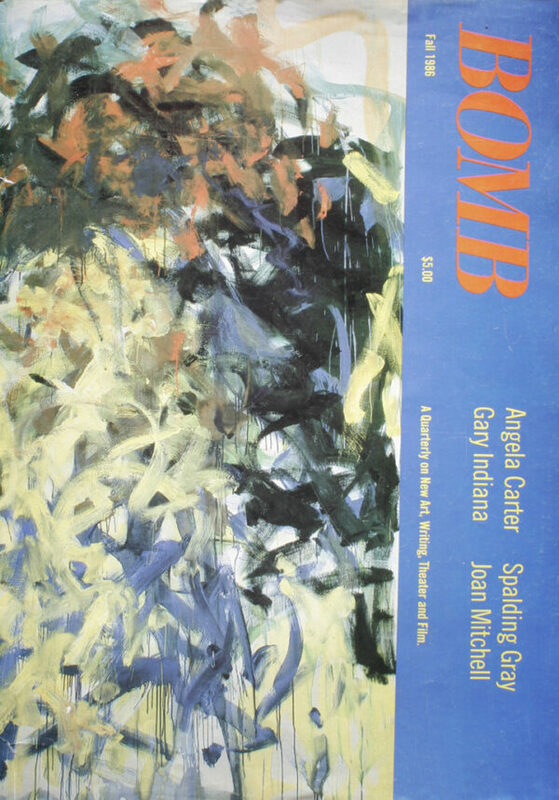 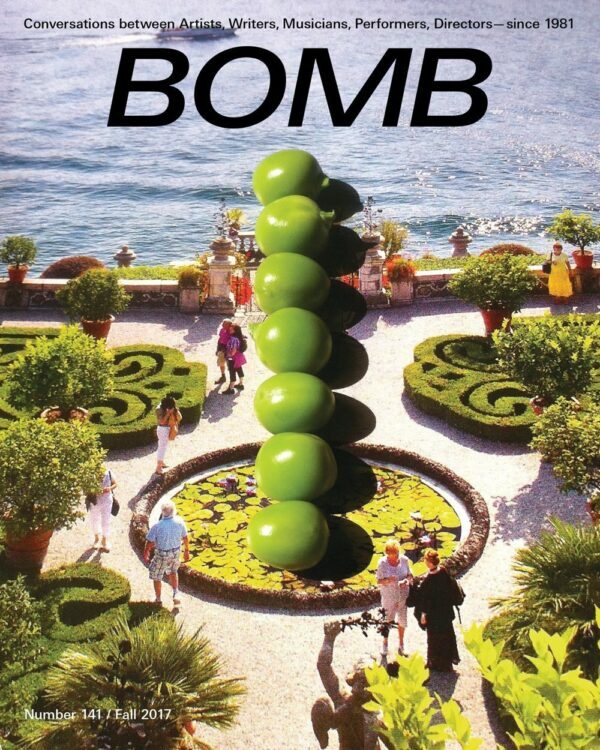 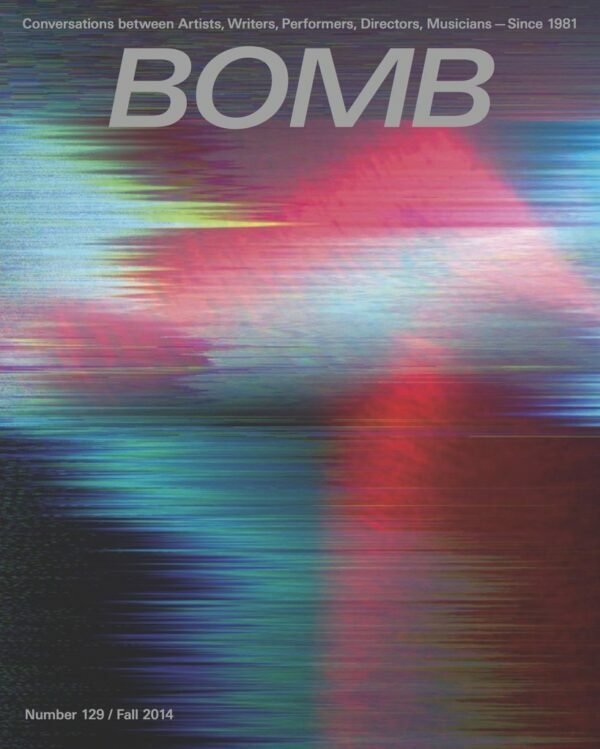 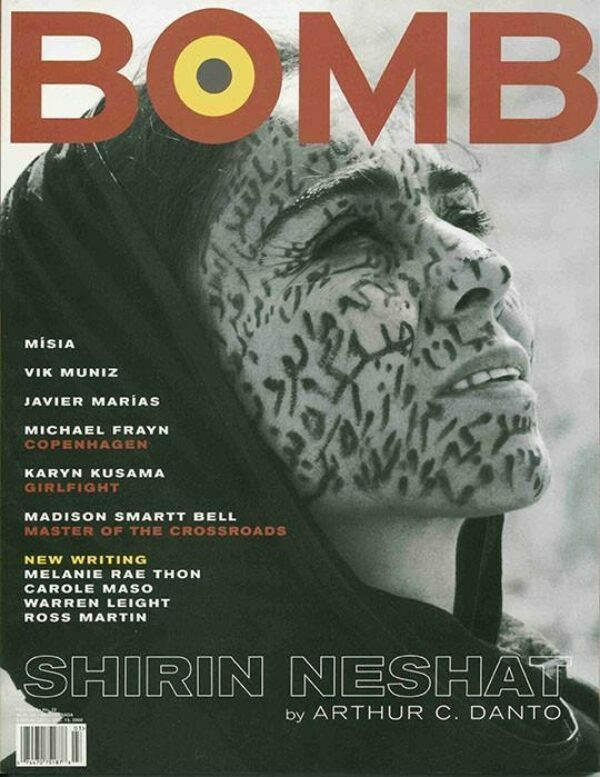 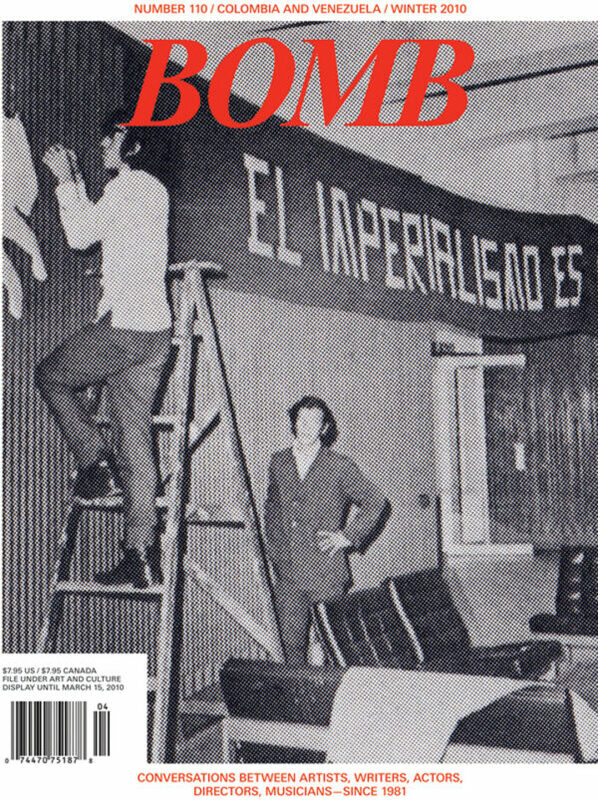 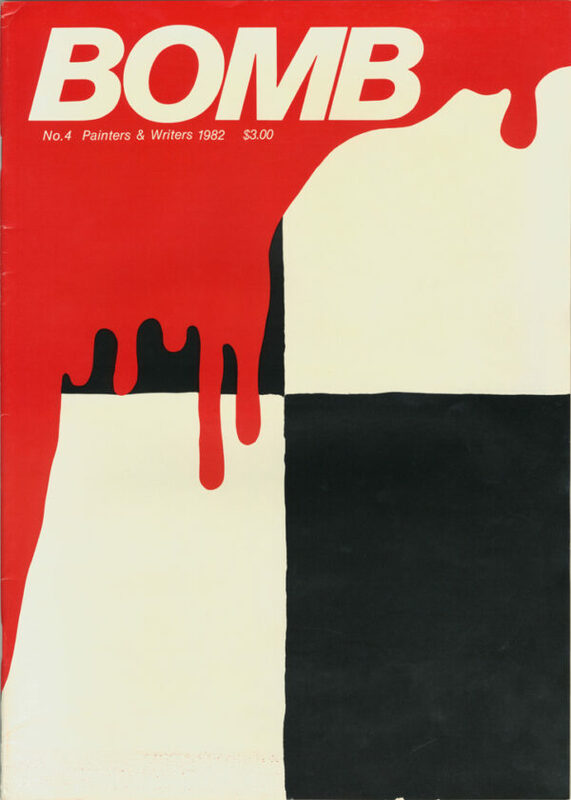 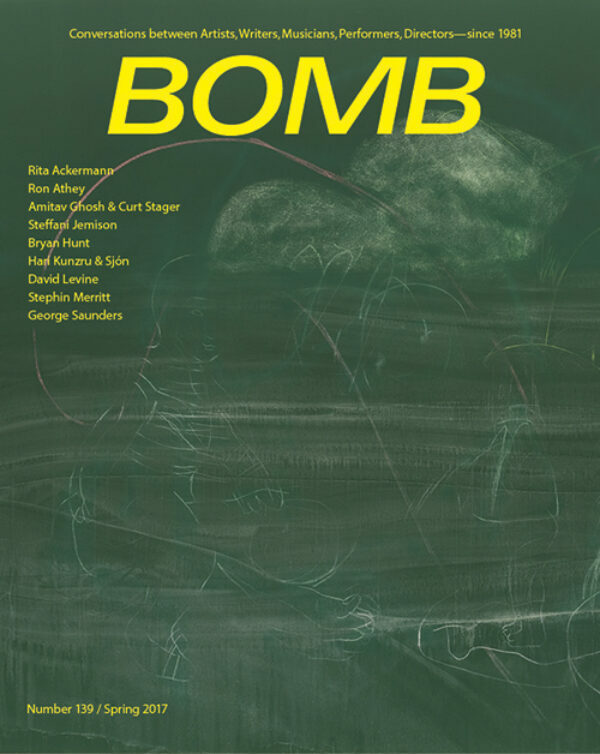 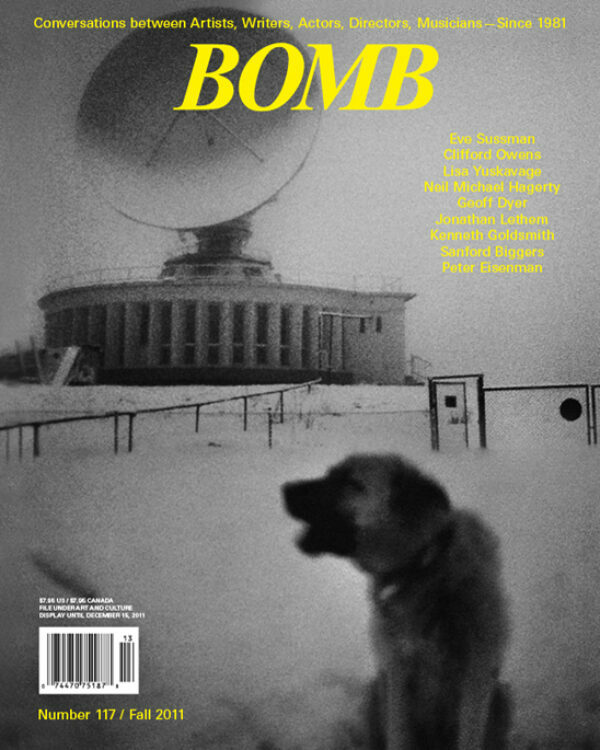 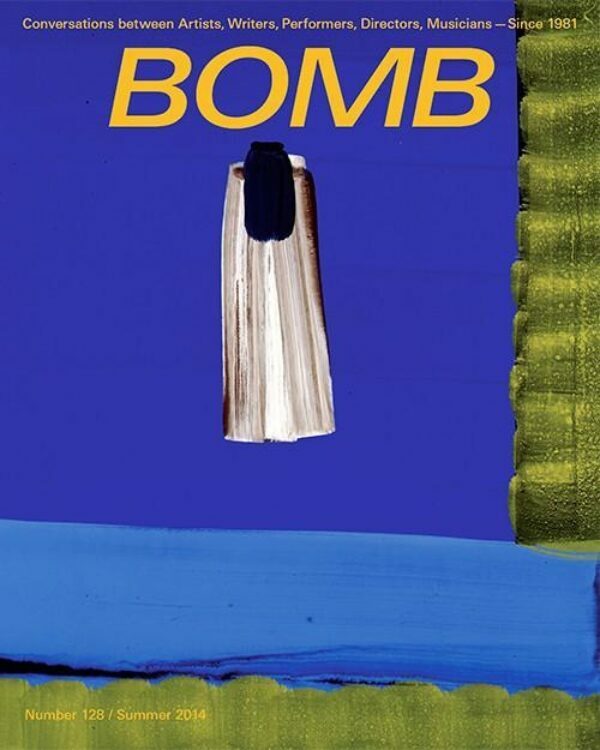 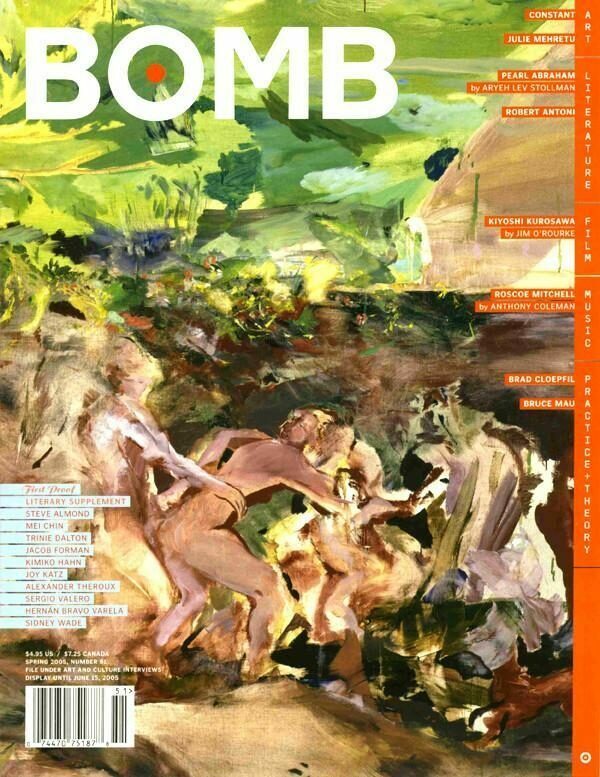 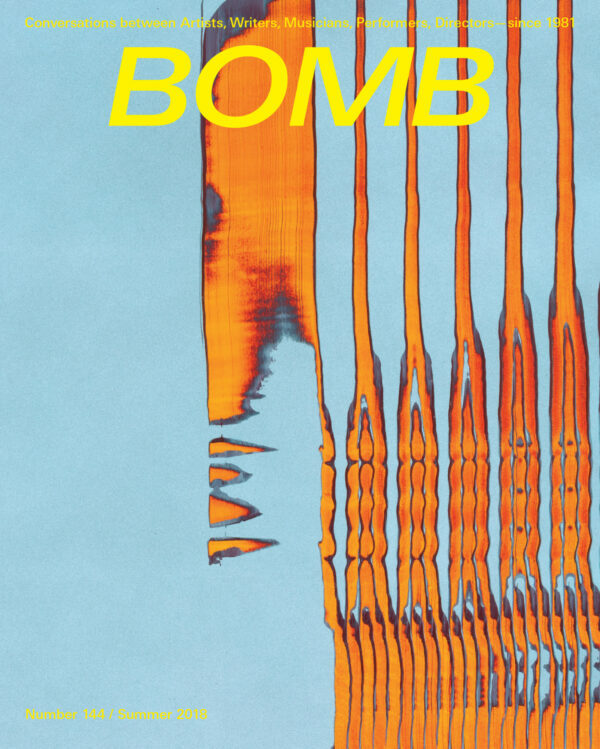 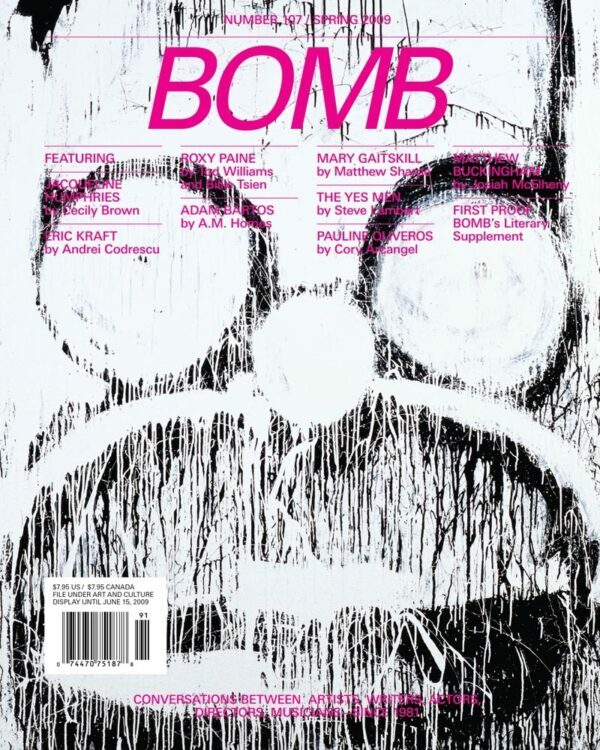 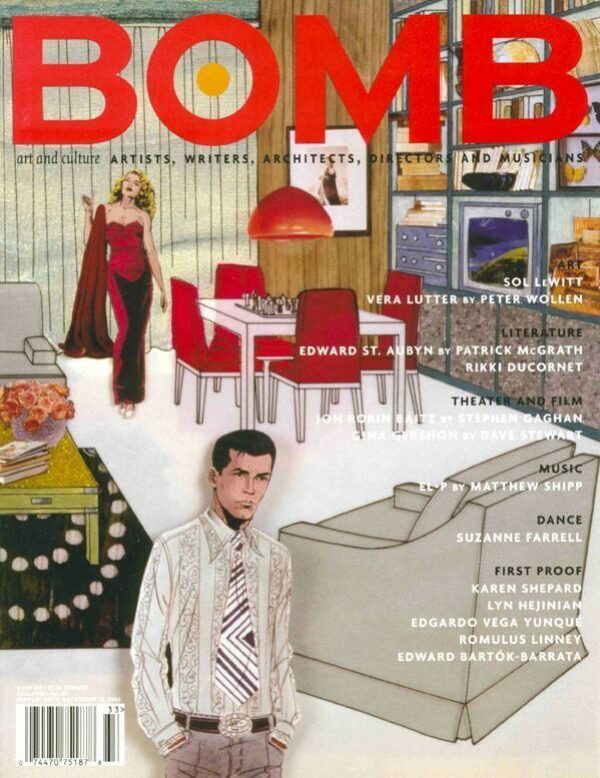 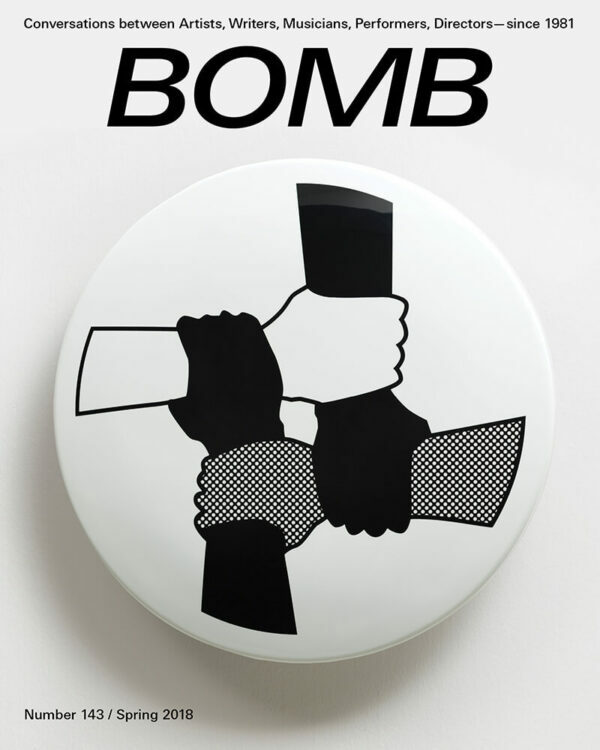 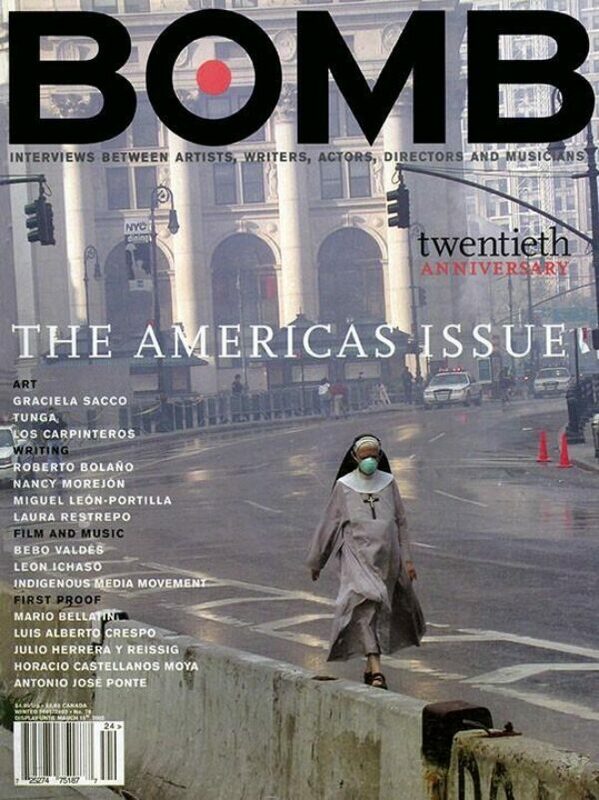 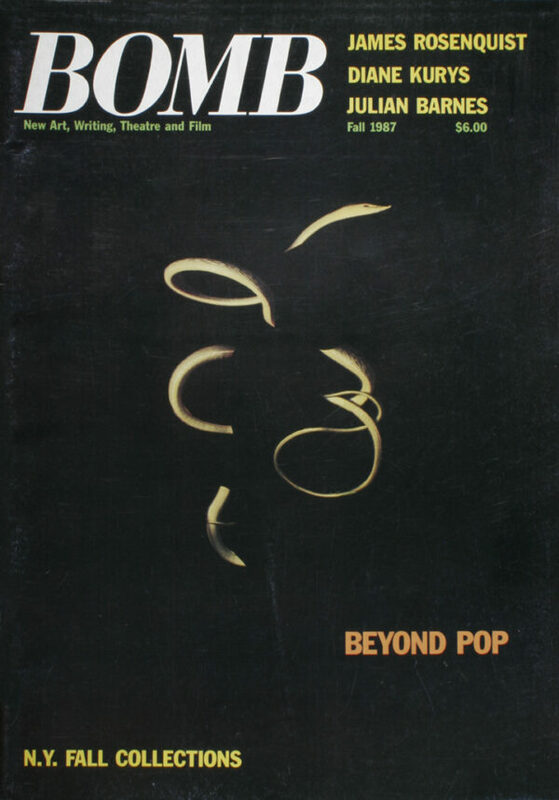 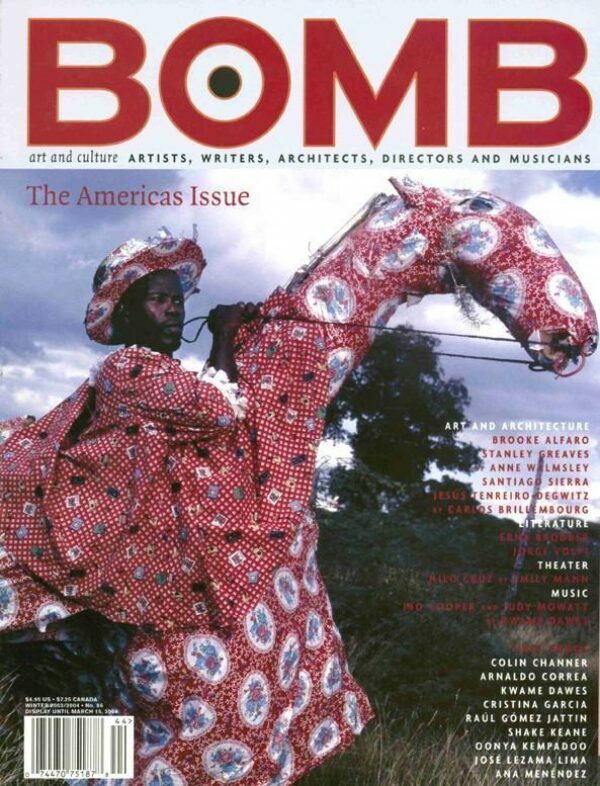 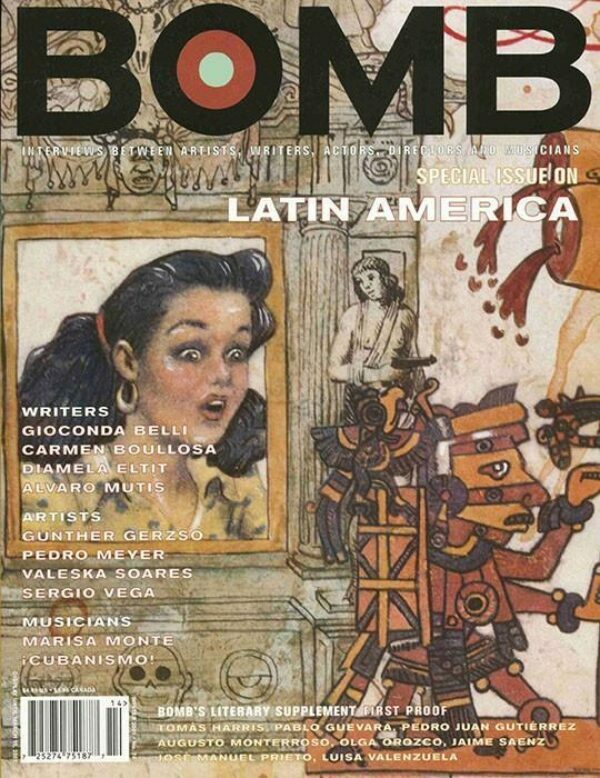 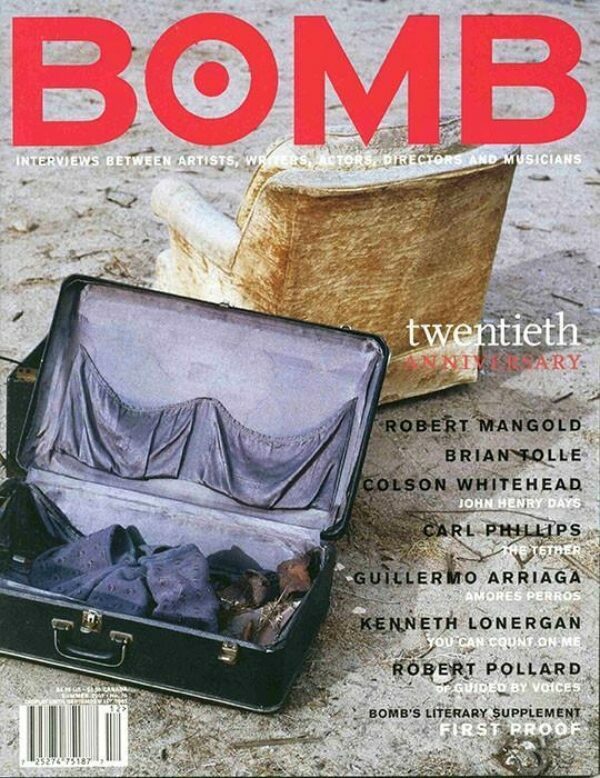 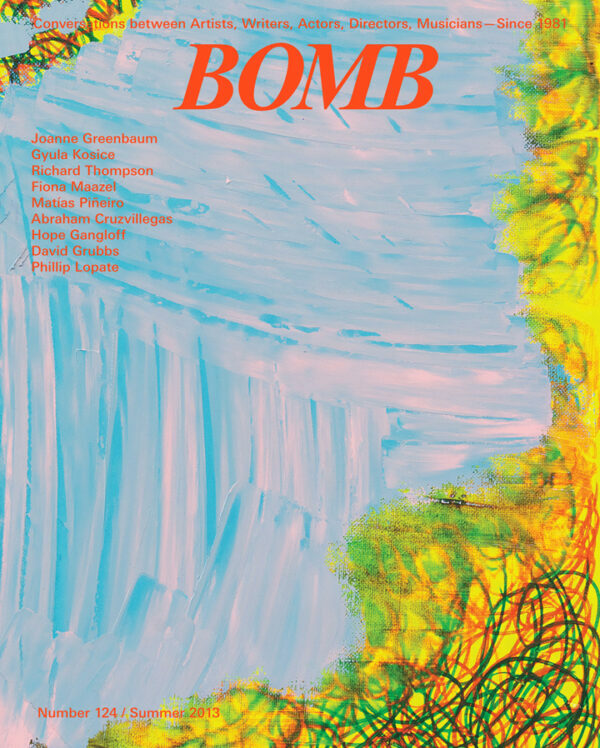 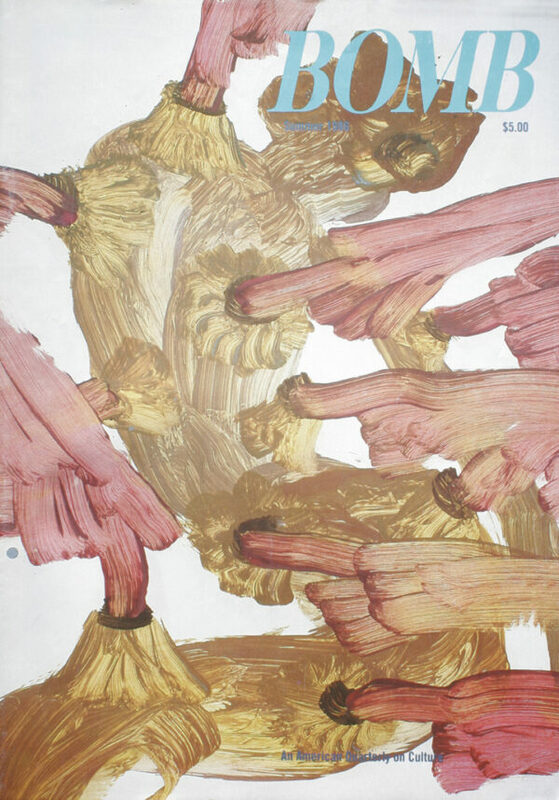 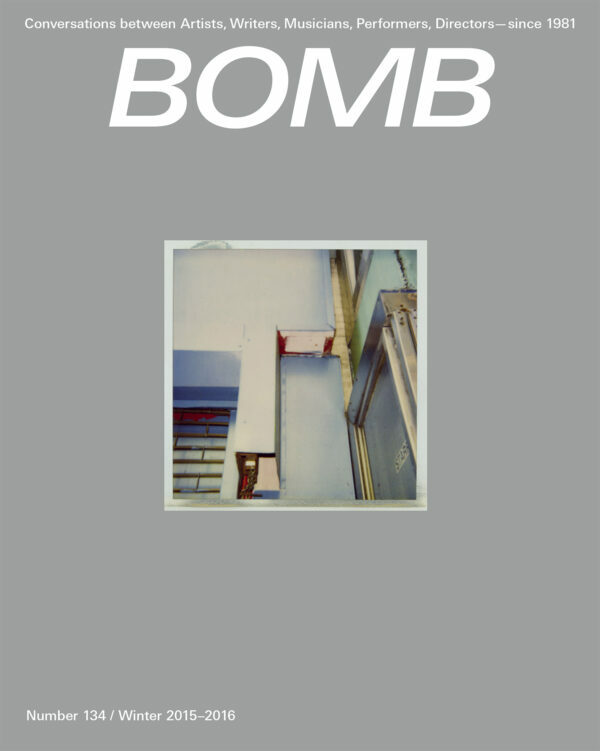 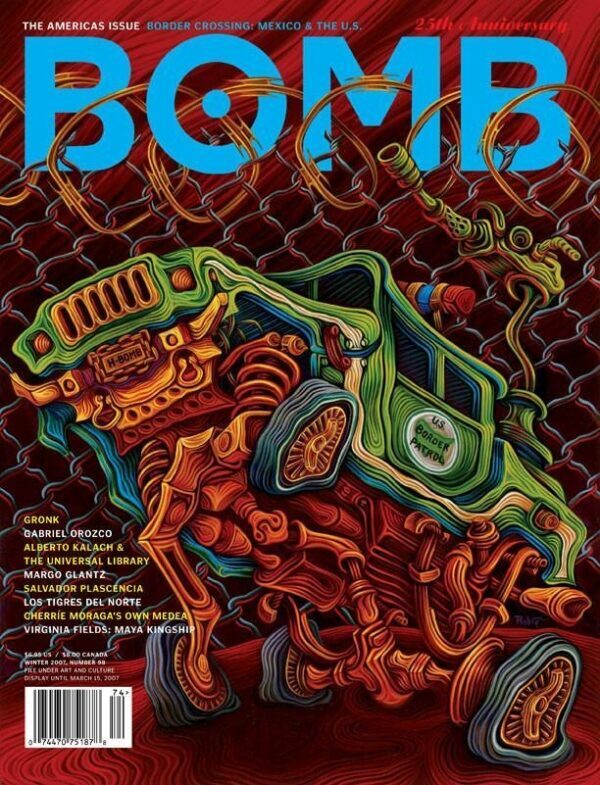 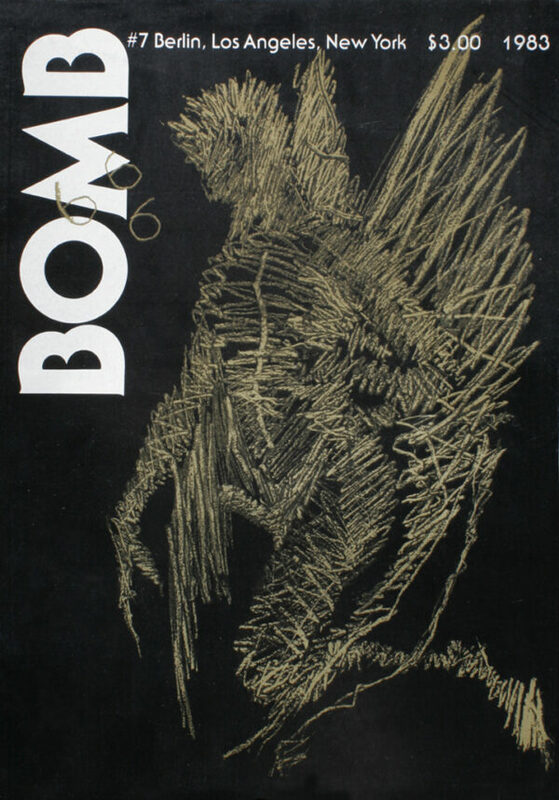 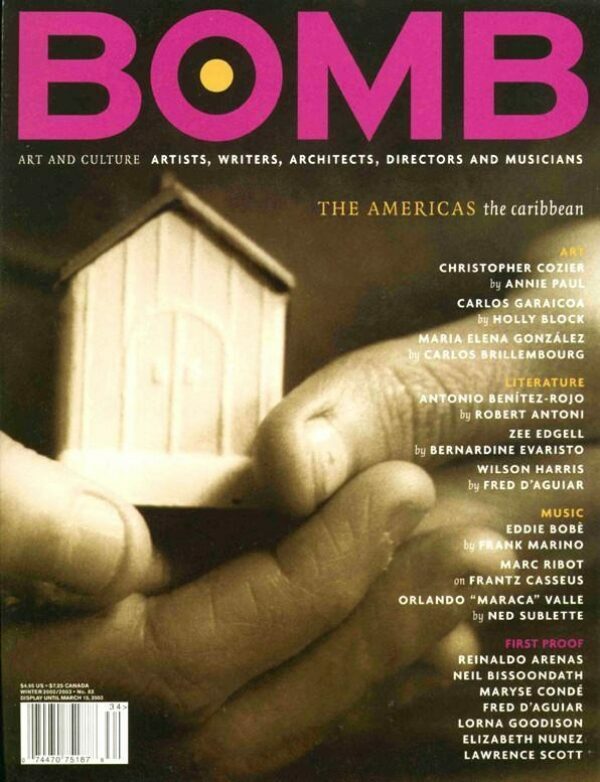 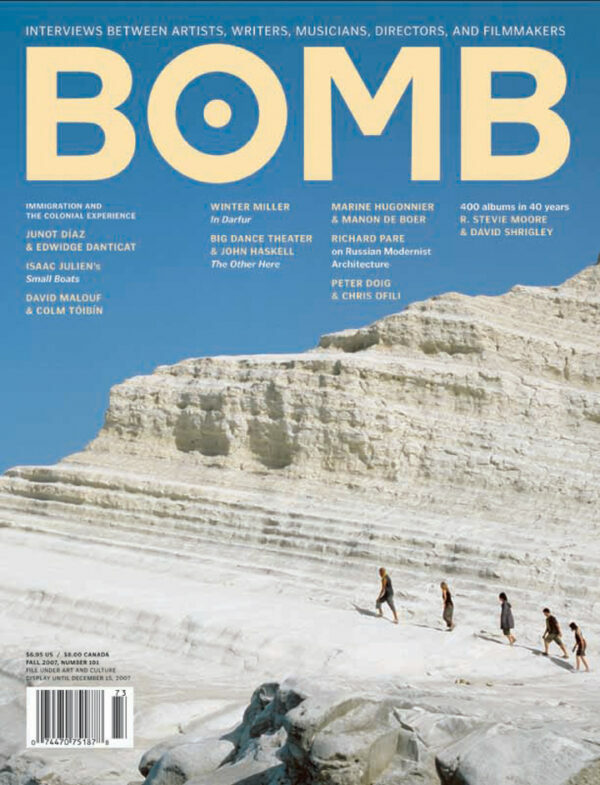 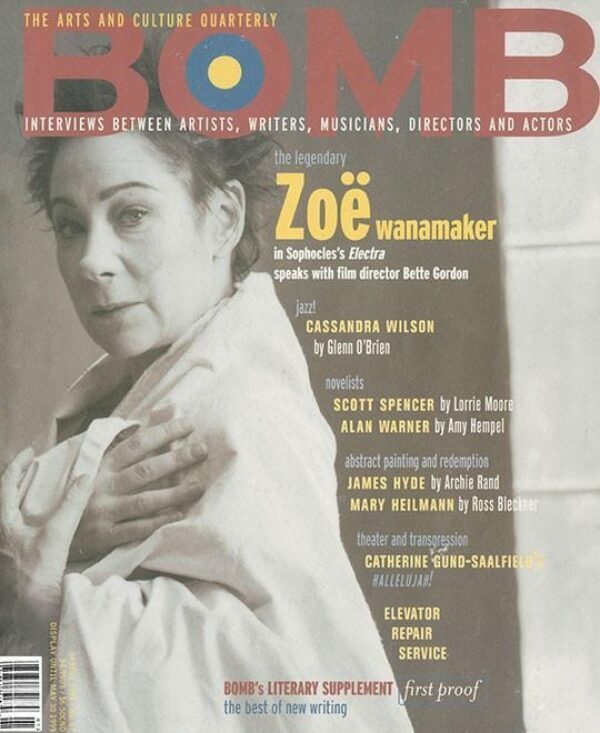 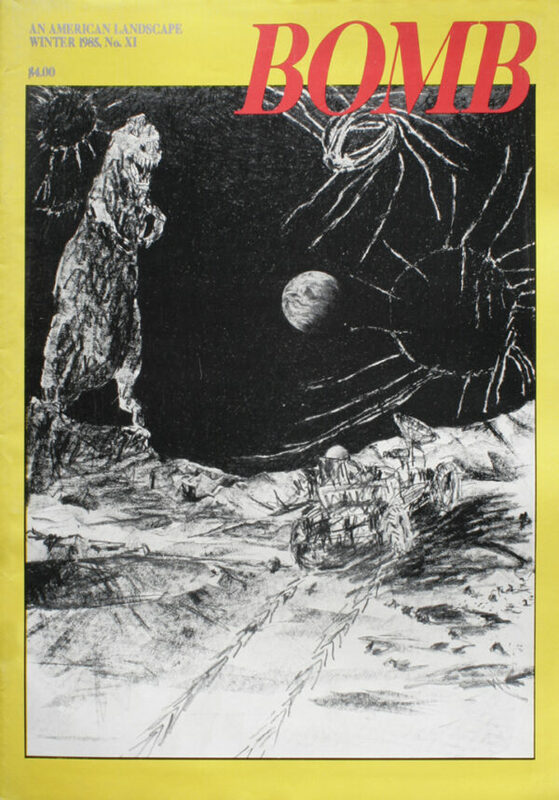 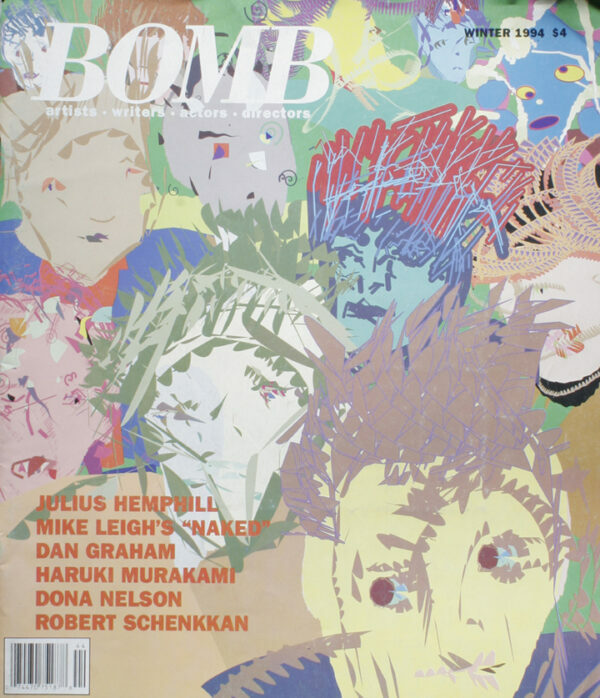 BOMB Magazine is a quarterly publication featuring conversations between artists of all disciplines since 1981. 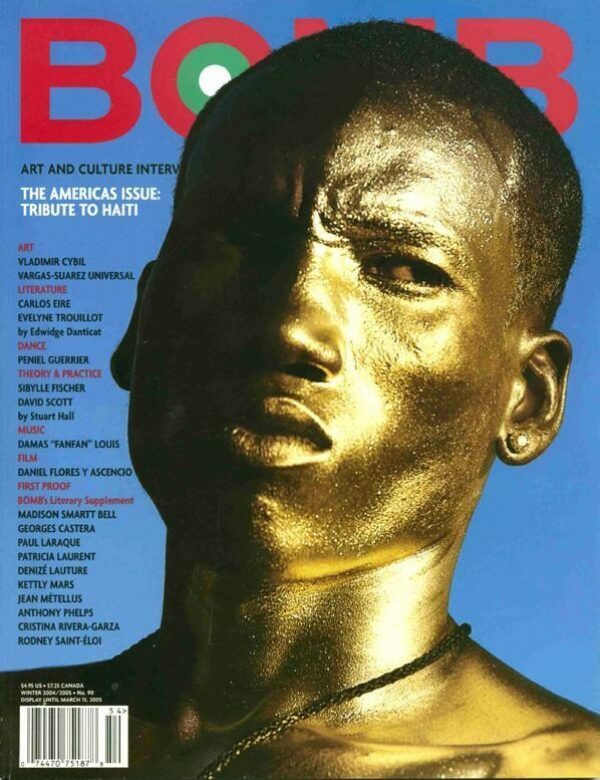 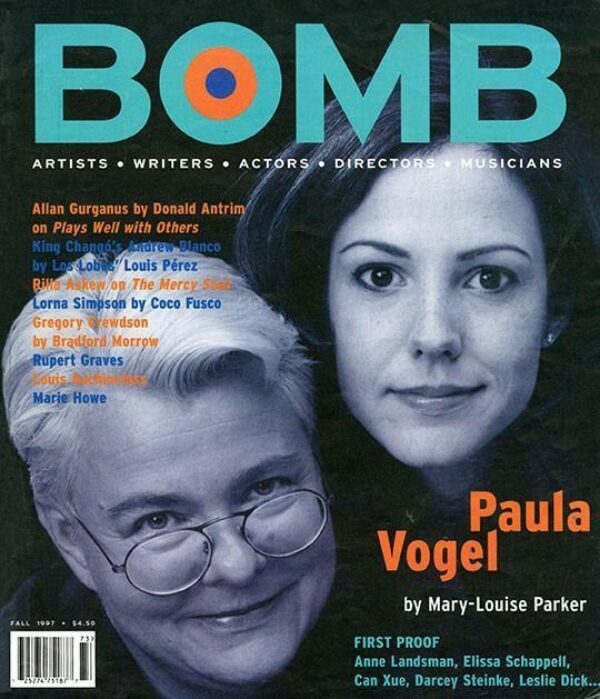 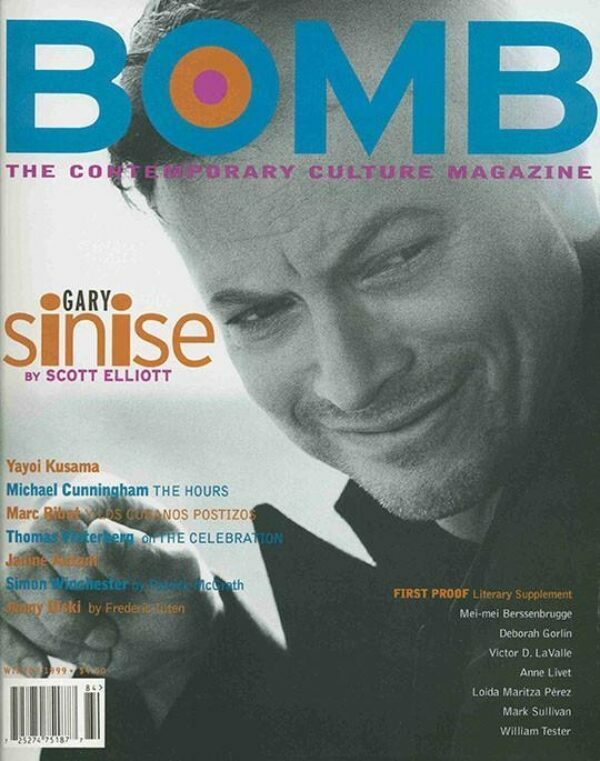 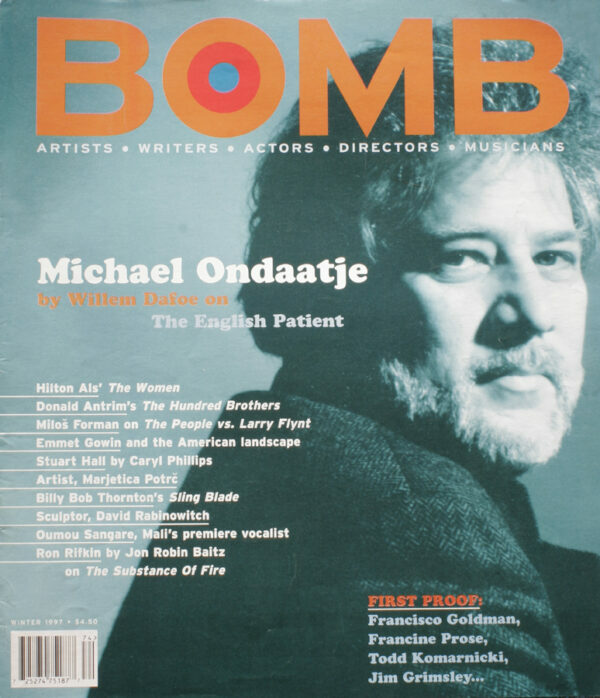 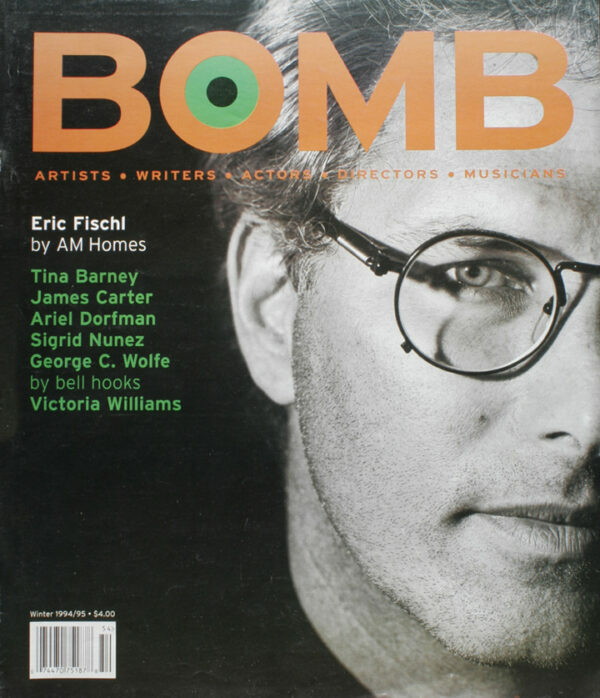 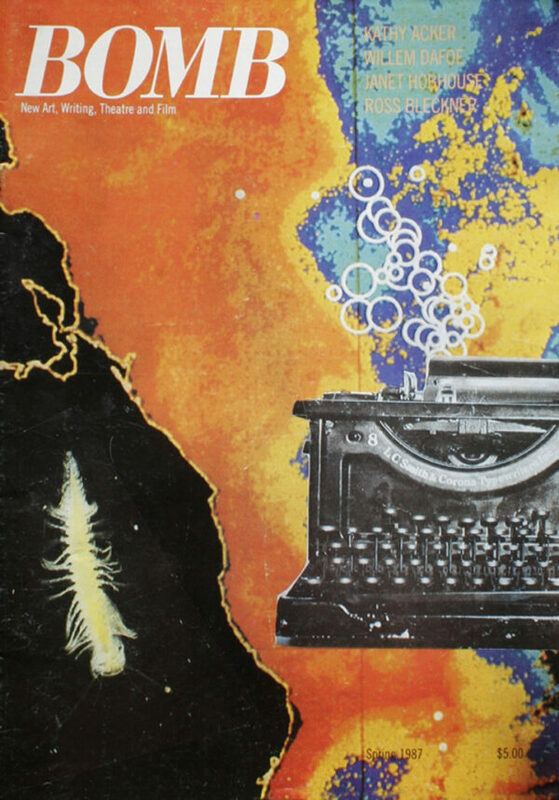 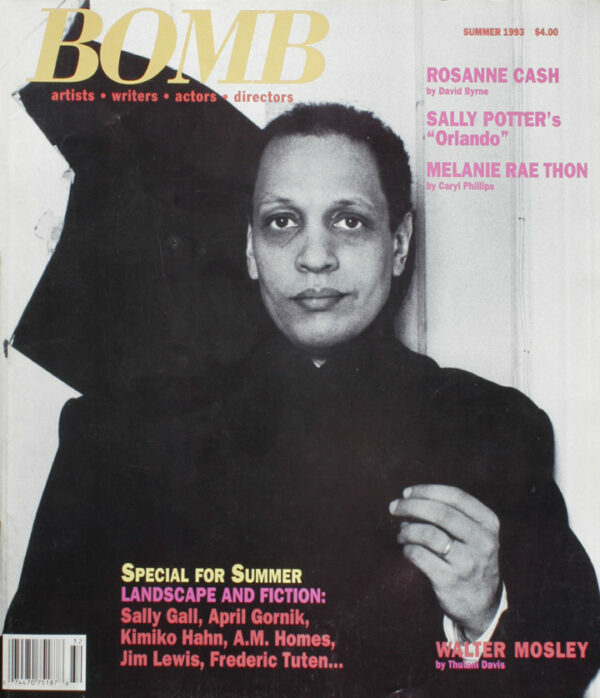 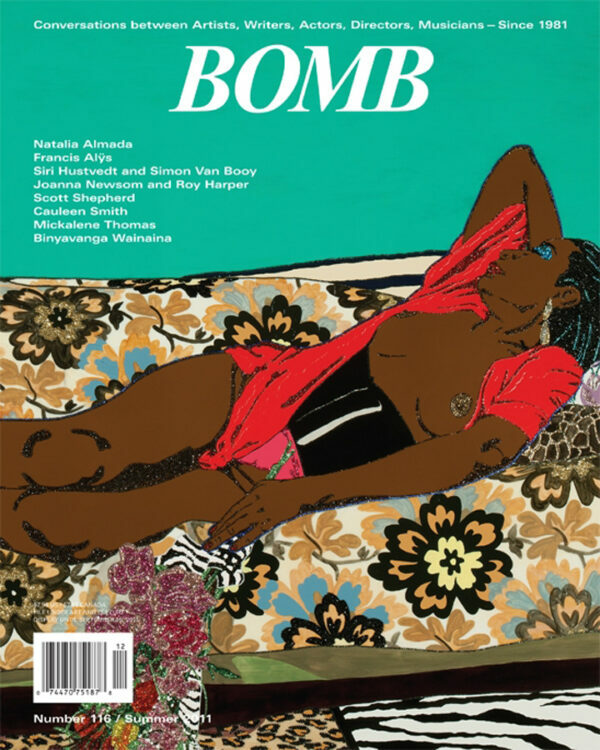 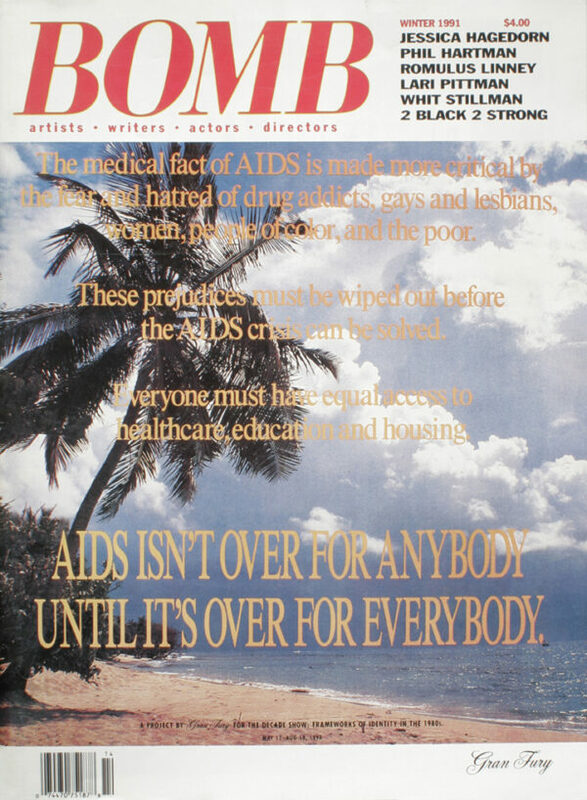 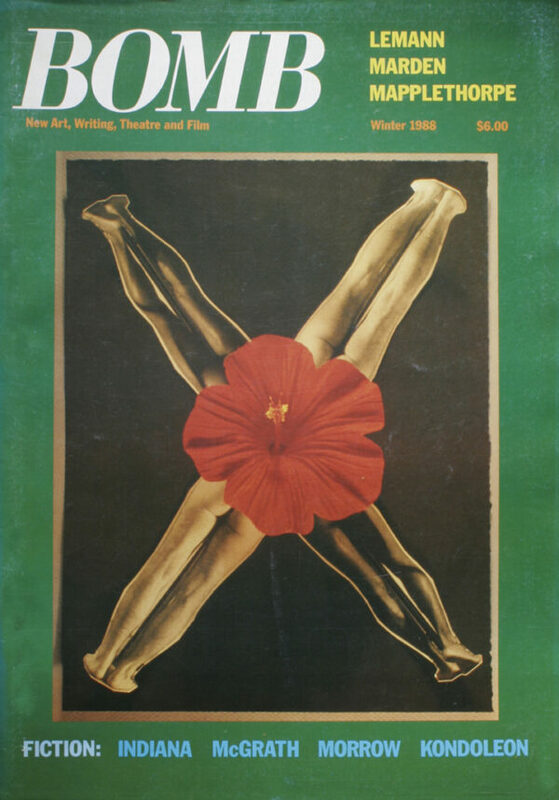 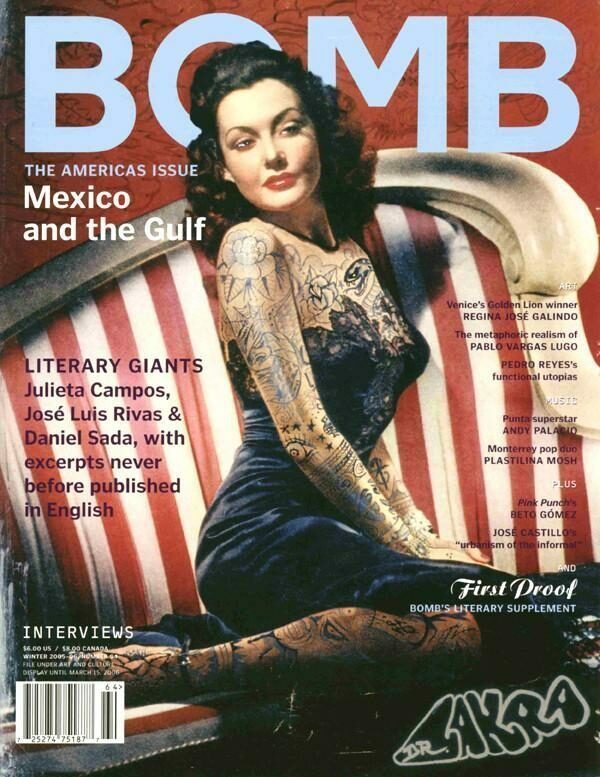 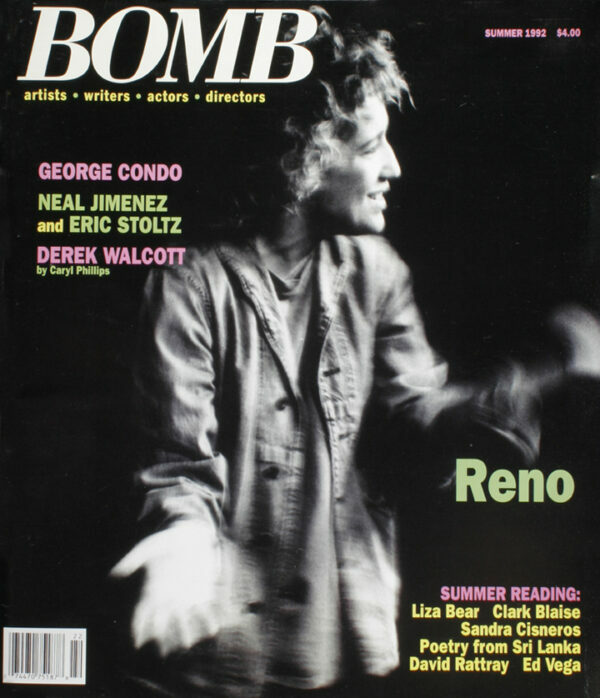 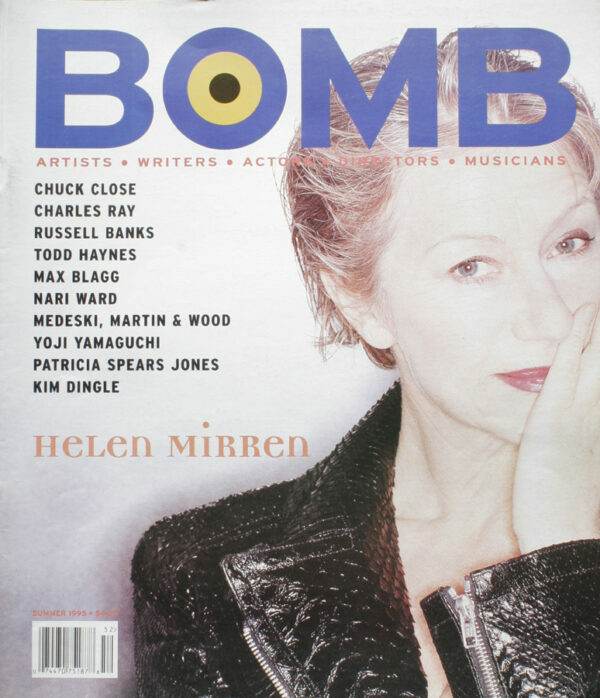 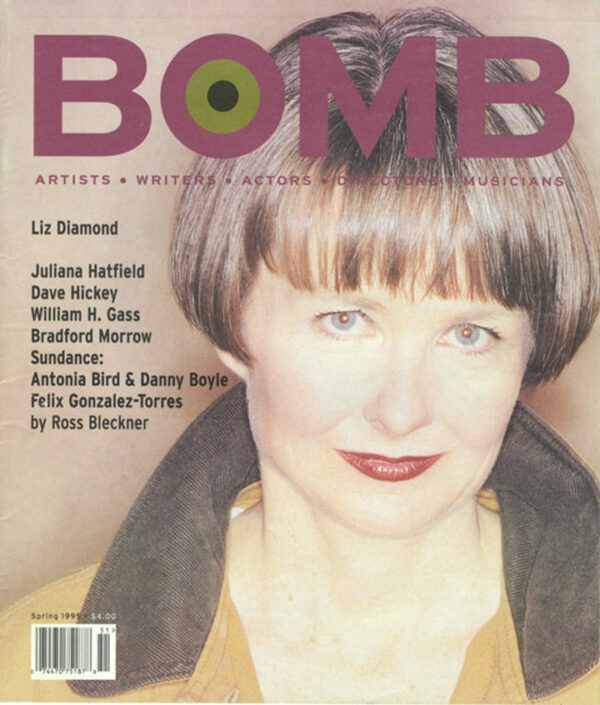 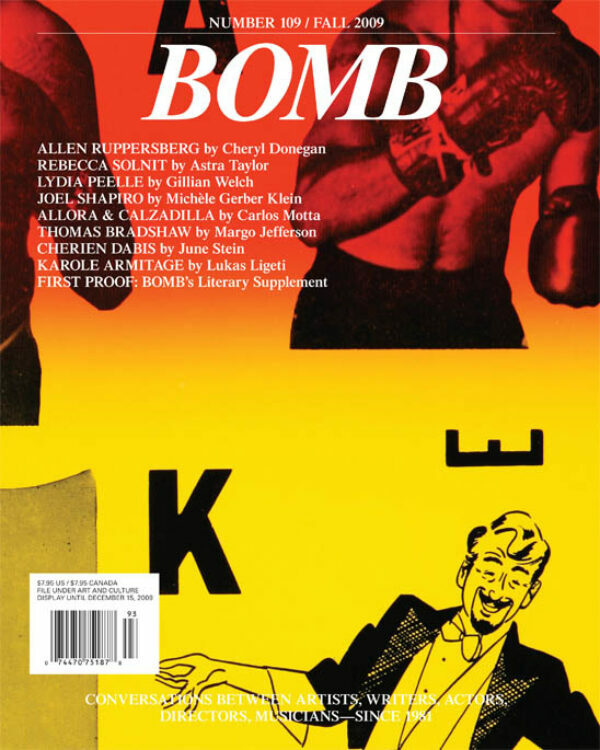 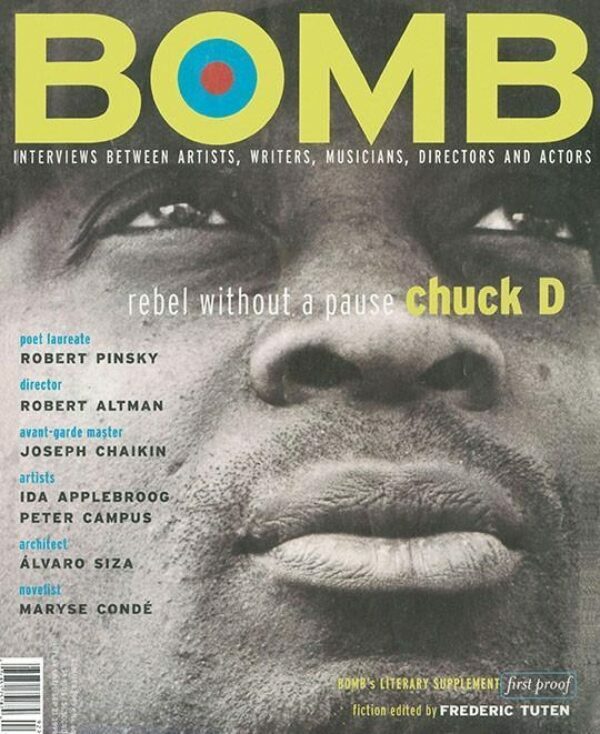 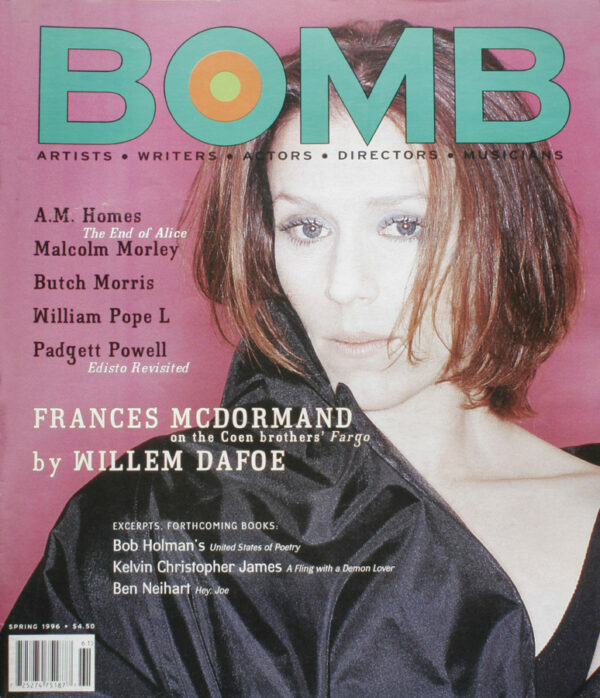 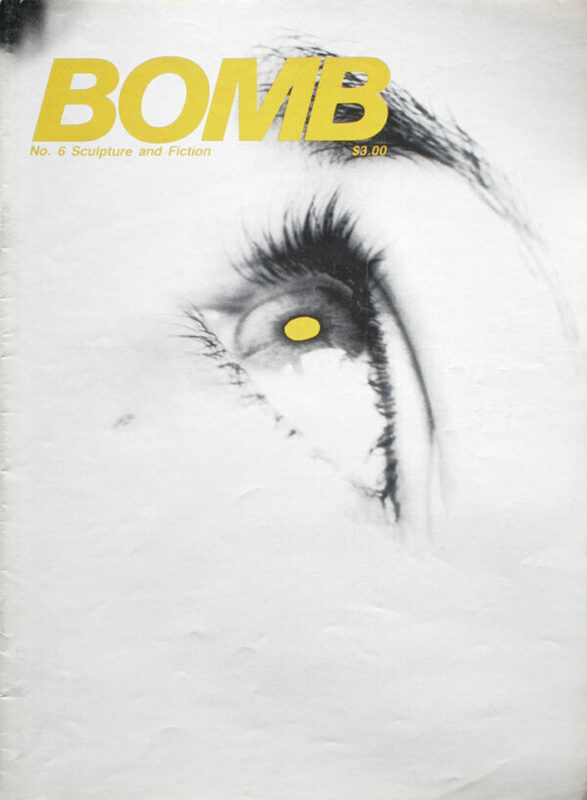 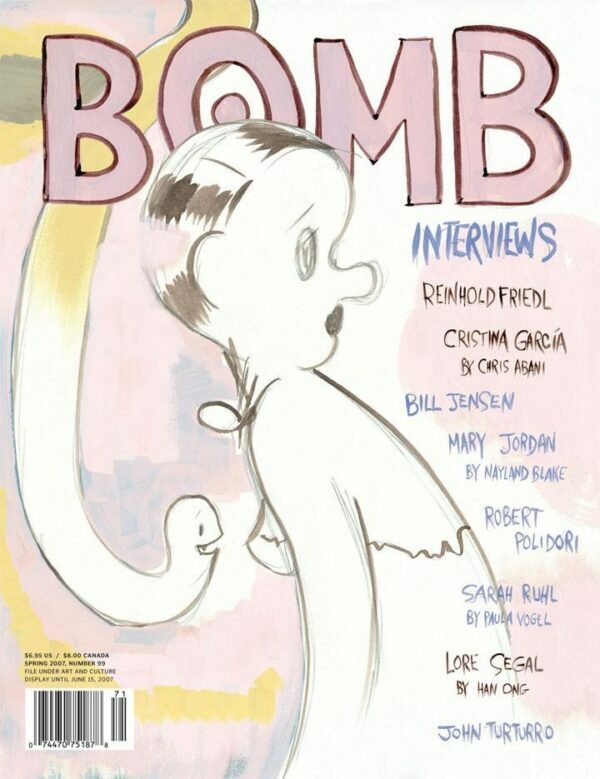 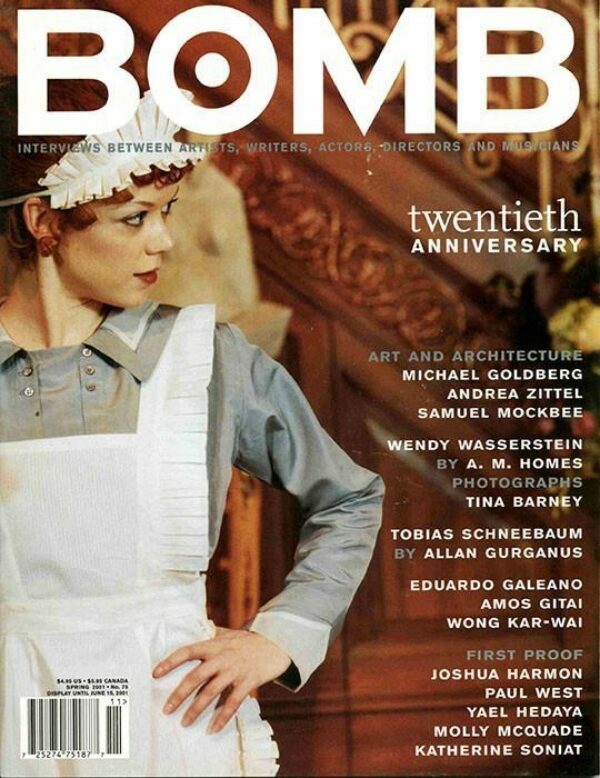 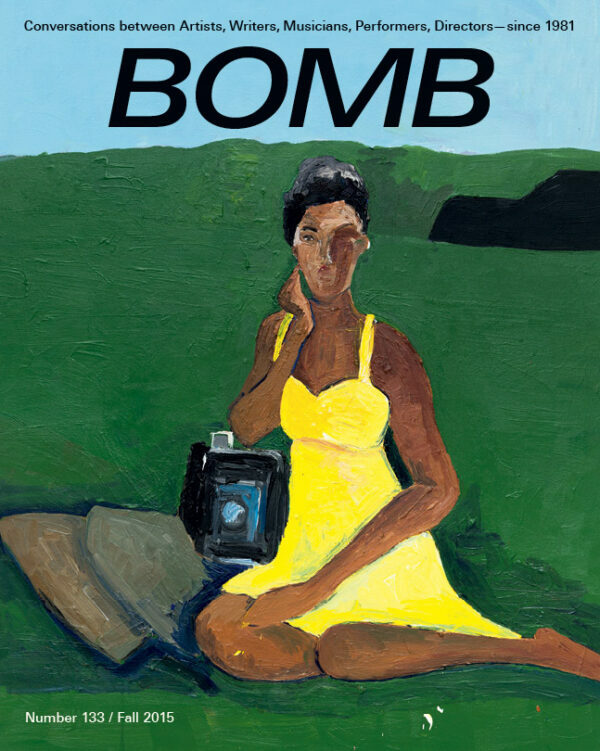 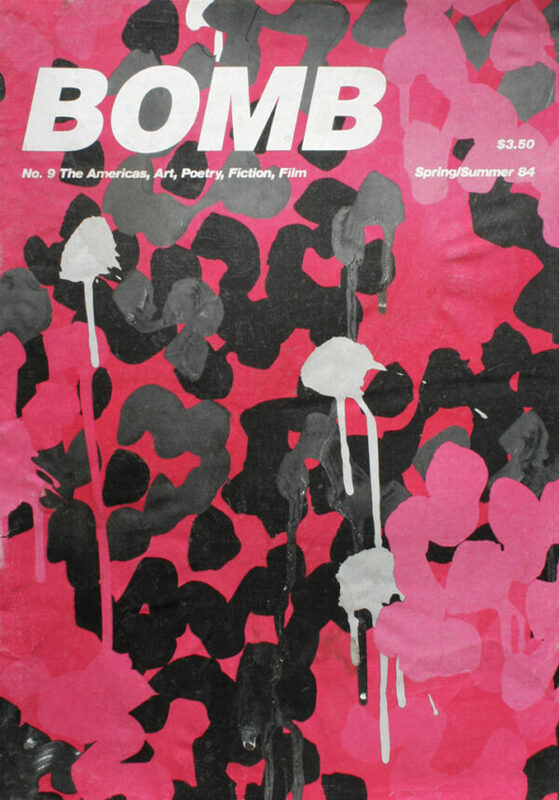 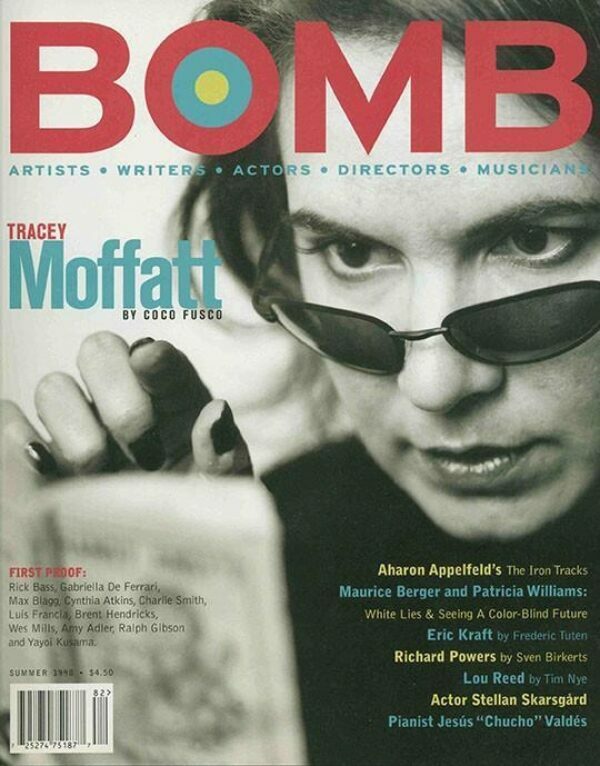 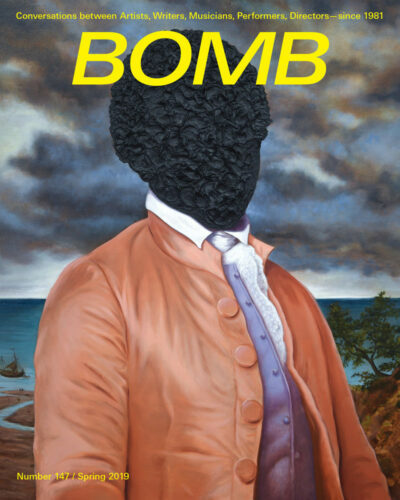 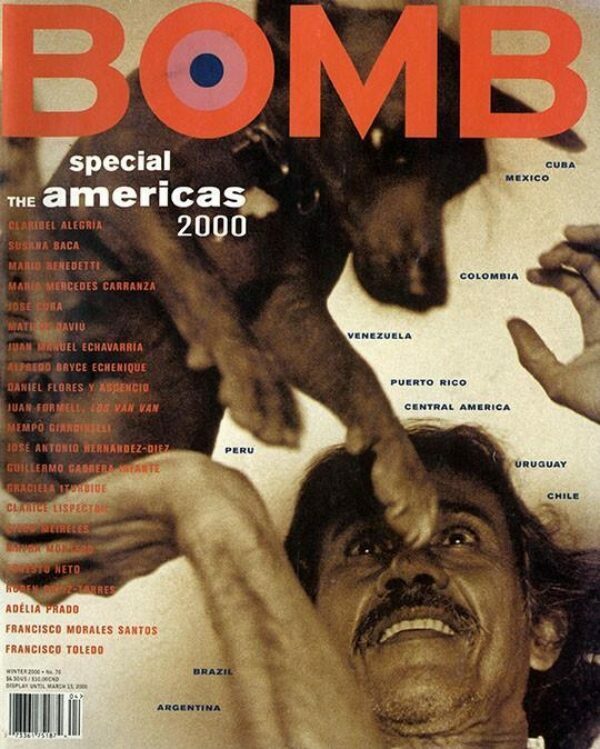 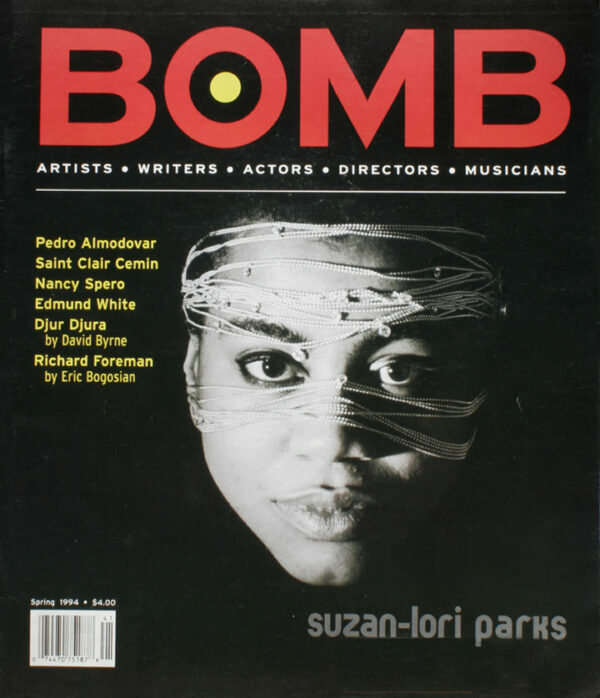 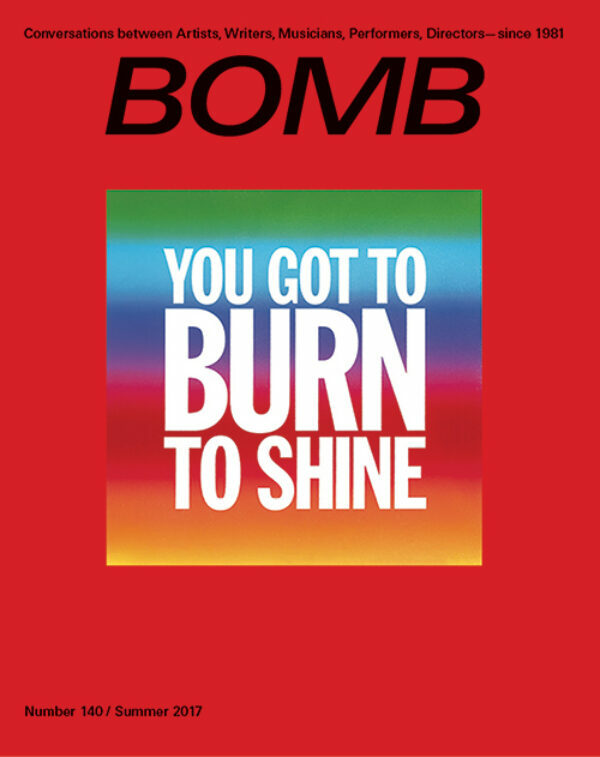 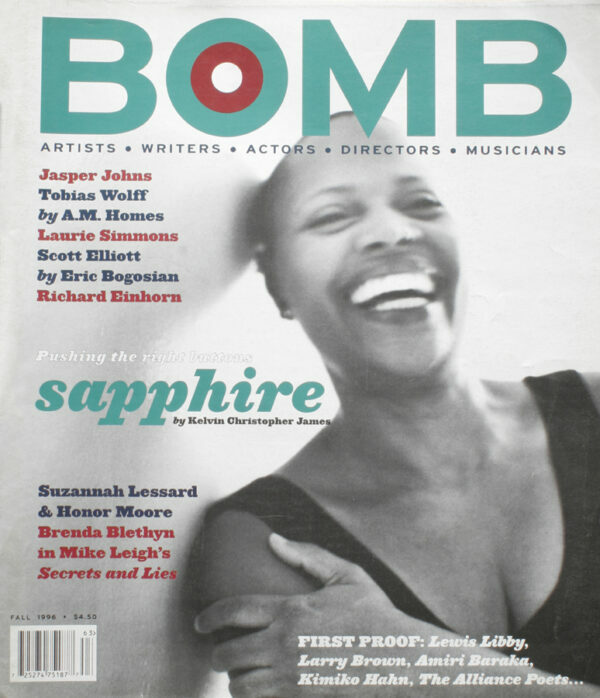 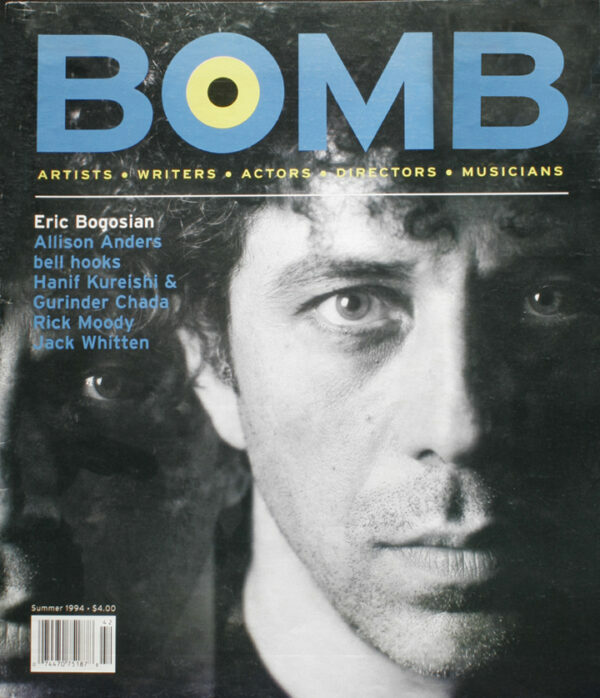 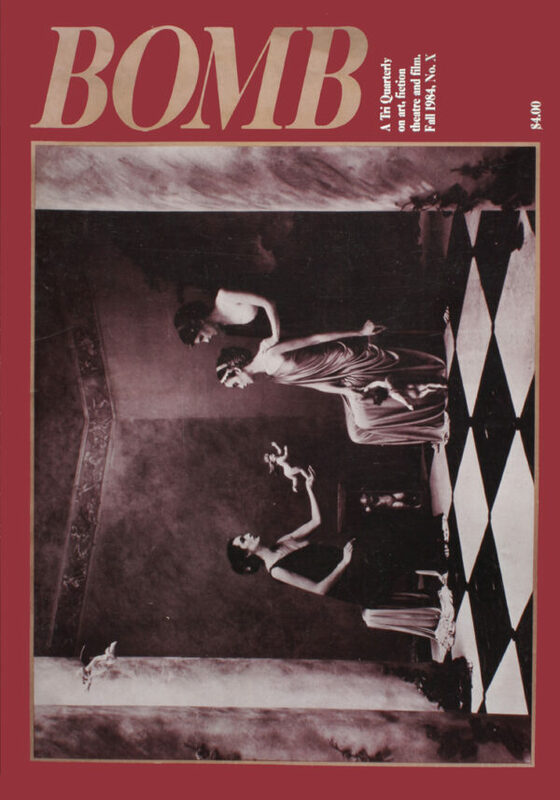 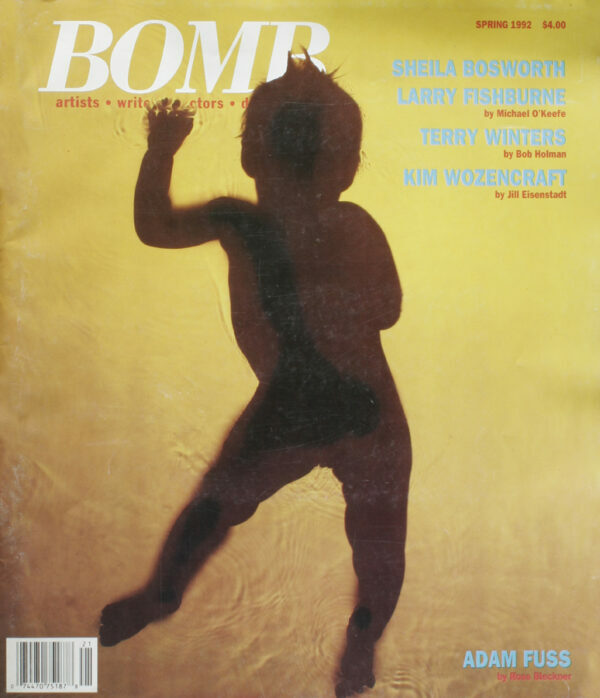 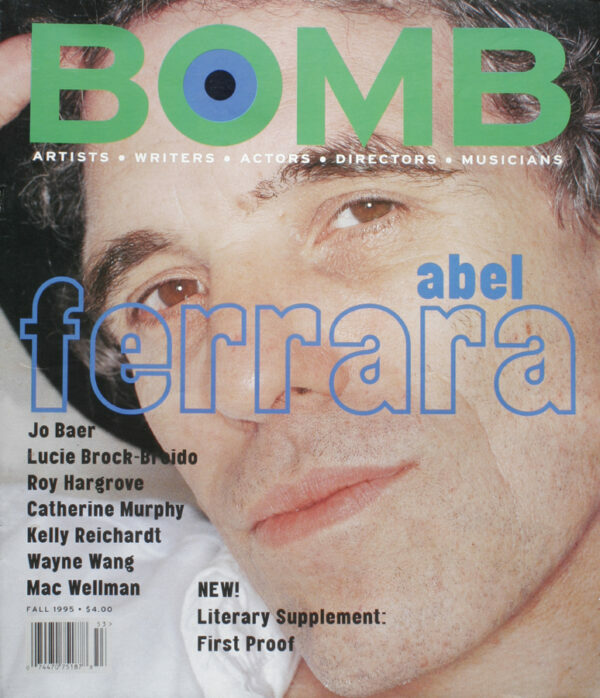 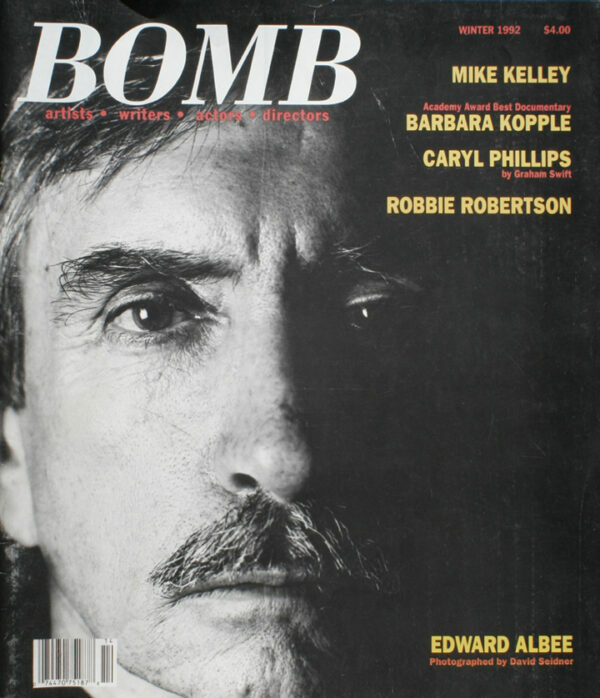 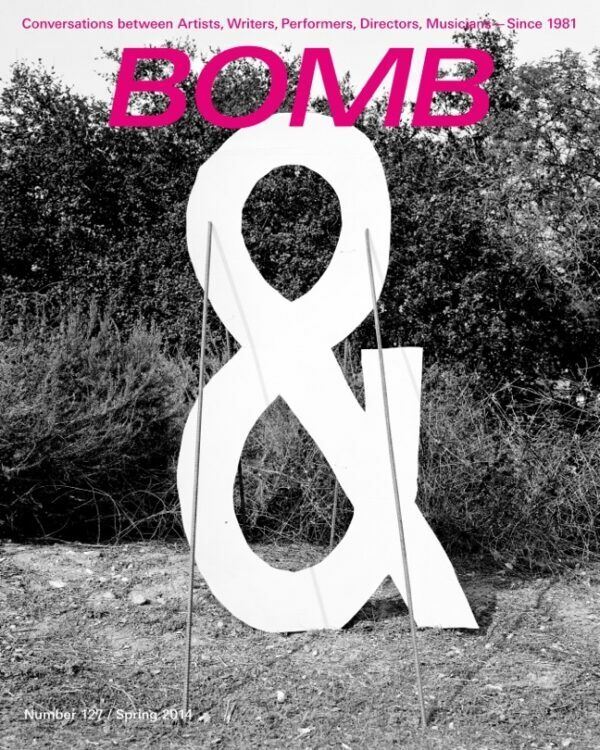 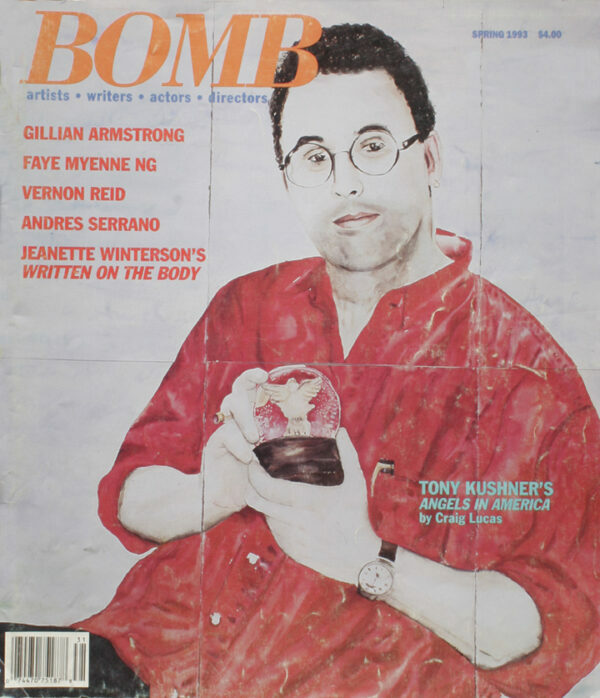 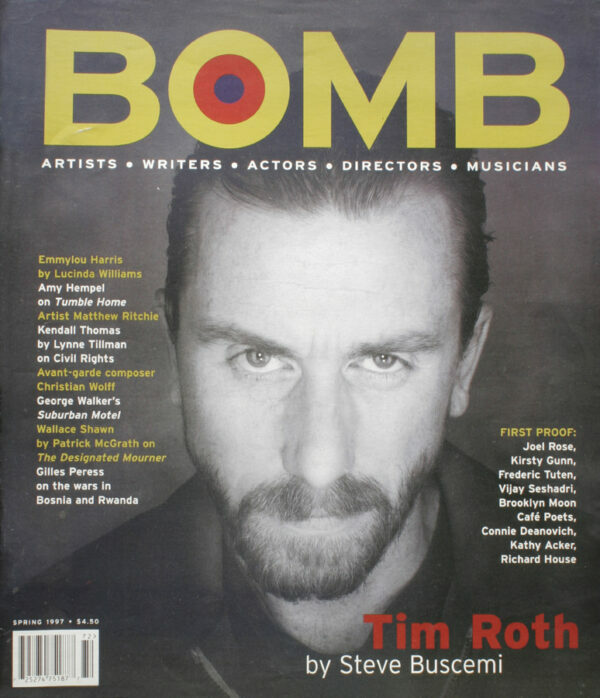 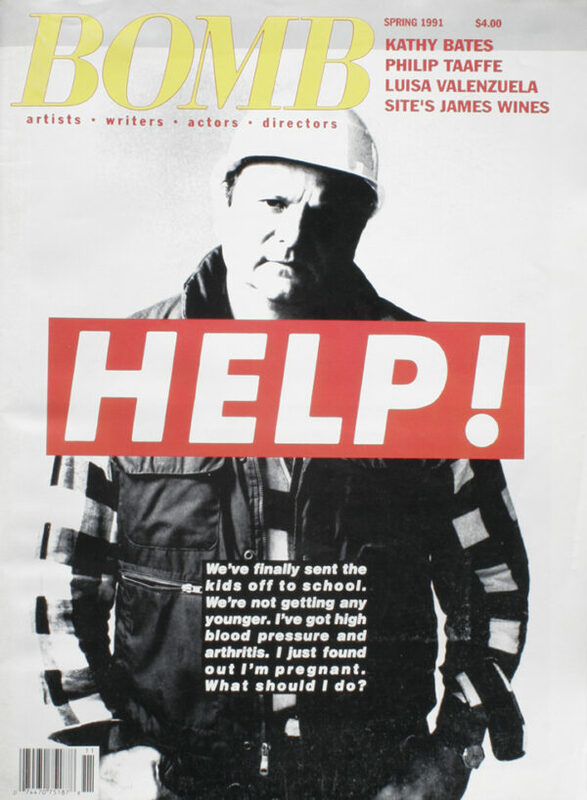 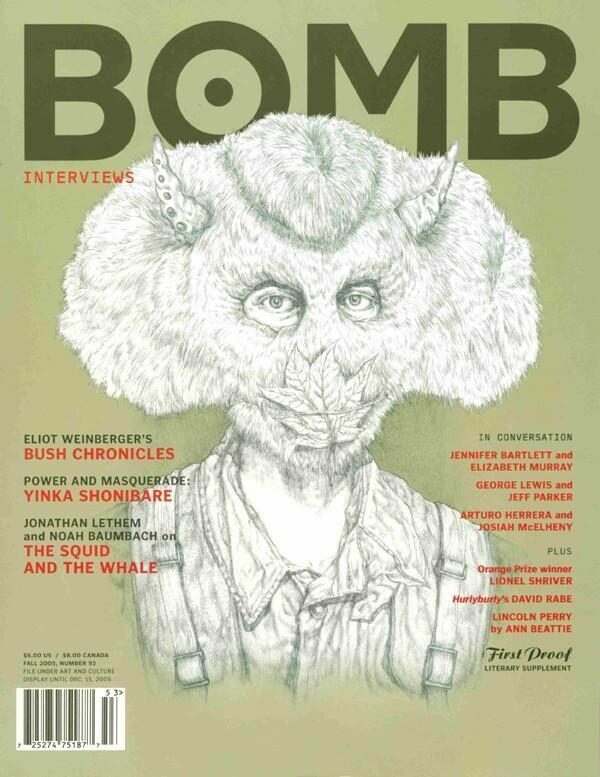 BOMB’s founders created the magazine because they saw a disparity between the way artists talked about their work among themselves and the way critics described it. 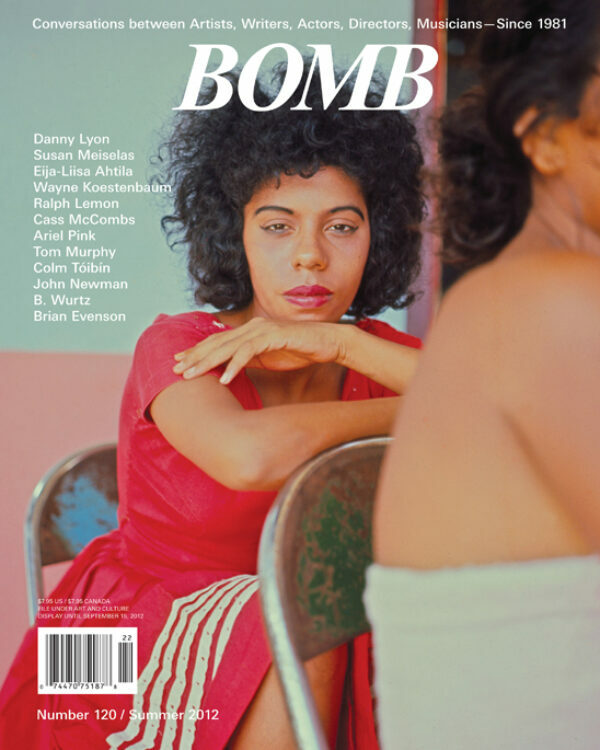 Featuring interviews with Francis Alÿs, Carla Faesler, Binyavanga Wainaina and Rob Spillman, Simon Van Booy and Siri Hustvedt, Natalia Almada, Joanna Newsom and Roy Harper, Scott Shepherd and Richard Maxwell, and Mickalene Thomas. 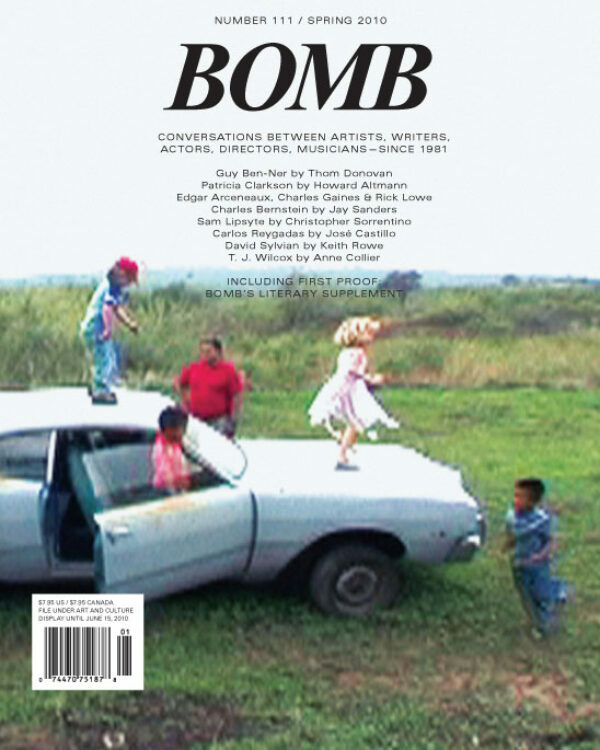 Featuring interviews with Joseph Bartscherer, Steve DiBenedetto, Jonathan Lethem and Lydia Millet, Zachary Lazar, Harmony Korine, Tav Falco, and Philip Seymour Hoffman. 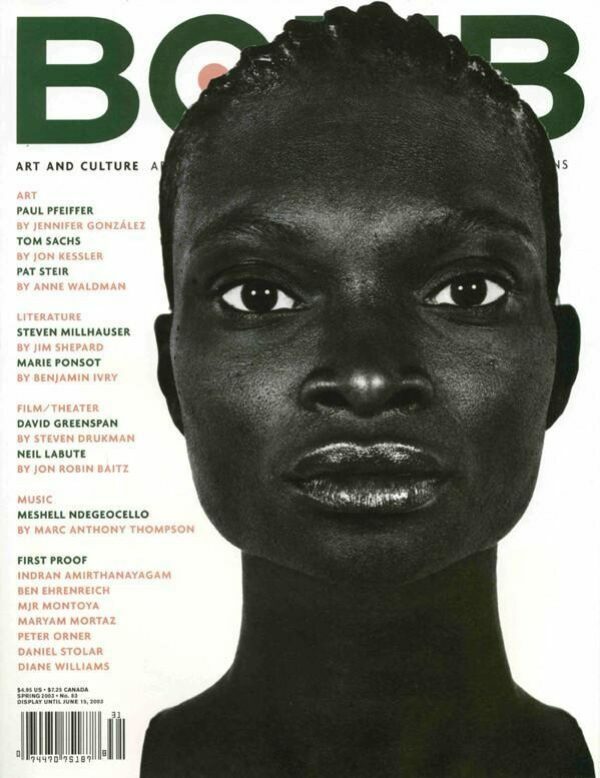 Featuring interviews with Chuck Close, Kara Walker, Mamma Andersson, Howard Norman, Peter Nadas, Bela Tarr, Benedict Mason, and Kate Valk. 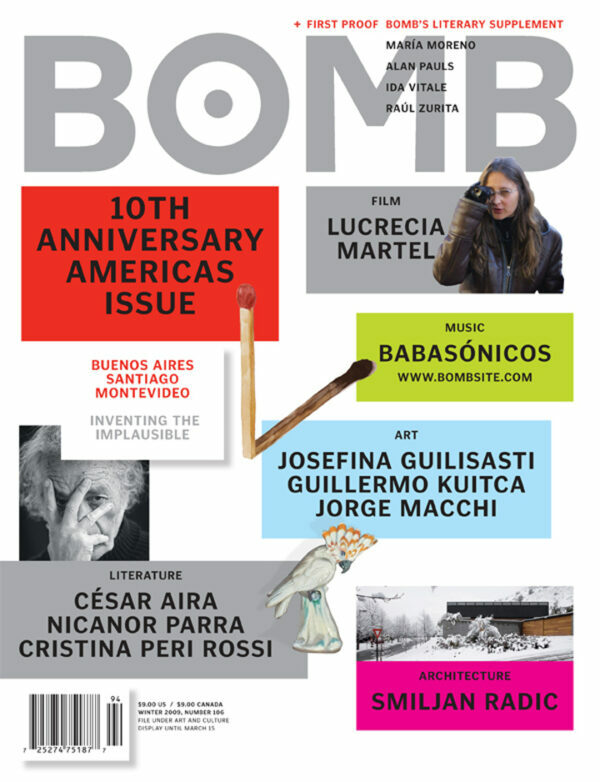 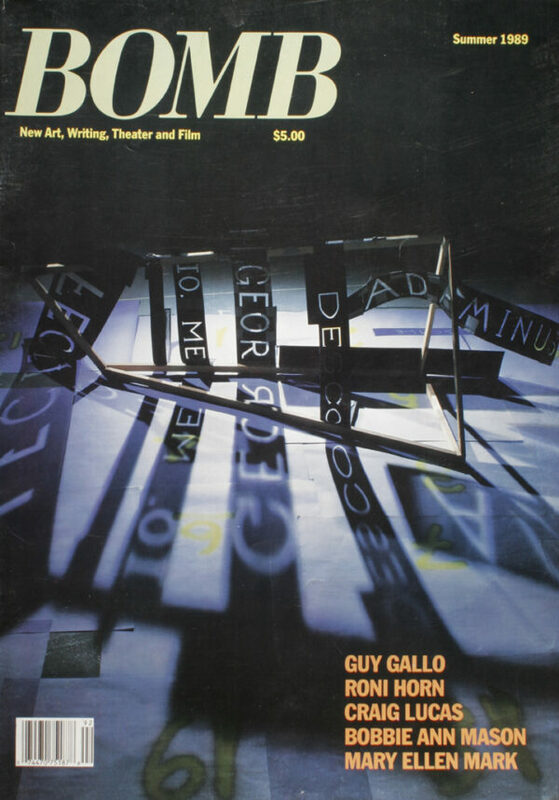 Featuring interviews with Gabriel Orozco, Gronk, Virginia Fields, Margo Glantz, Salvador Plascencia, Jorge Hernandez, Cherrie Moraga, Doña Julia Julieta Casimiro, Alberto Kalach. 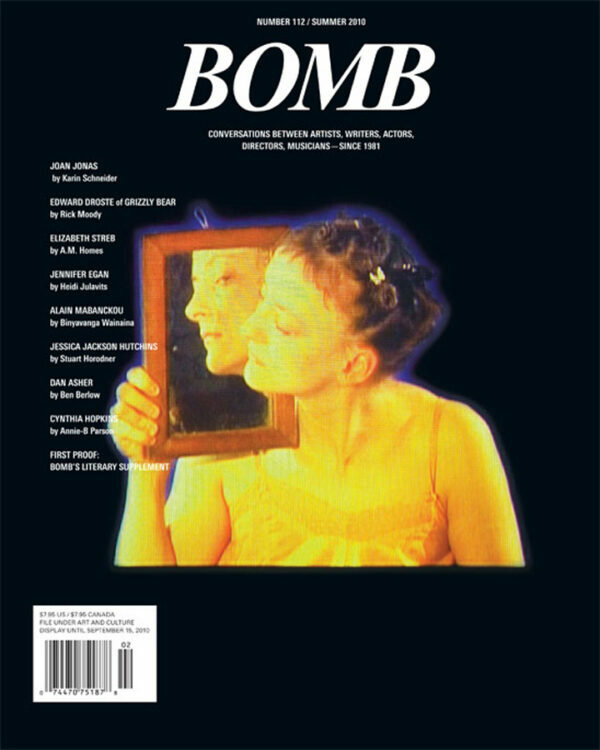 Featuring interviews with Marina Abramovic and Laurie Anderson, Paul McCarthy, Christian Marclay and Ben Neill, Jesse Reiser & Nanako Umemoto and Andrew Benjamin, Jimmy Santiago Baca and Adam Fuss, Aryeh Lev Stollman, Shari Springer Berman & Robert Pulciniby and Bette Gordon, and Elliott Sharp. 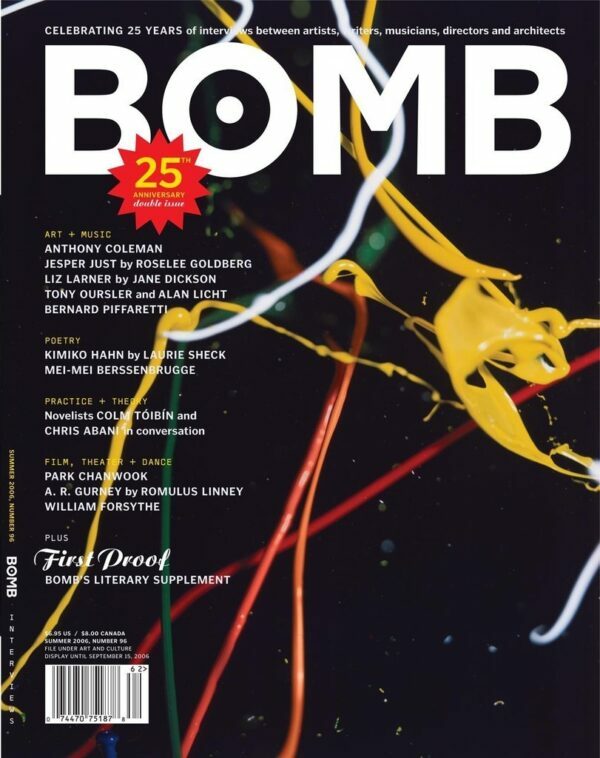 Featuring interviews with Vik Muniz, Shirin Neshat, Madison Smartt Bell, Javier Marias, Misia, Michael Frayn, Karyn Kusama, and Michael Roth. 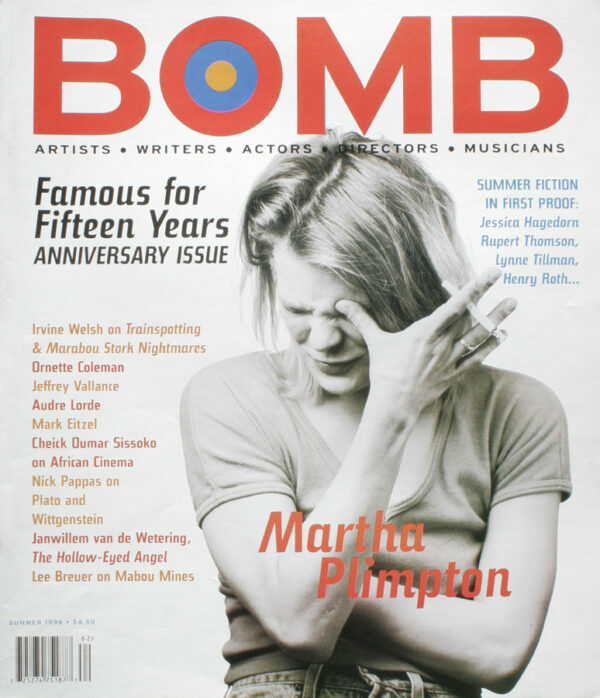 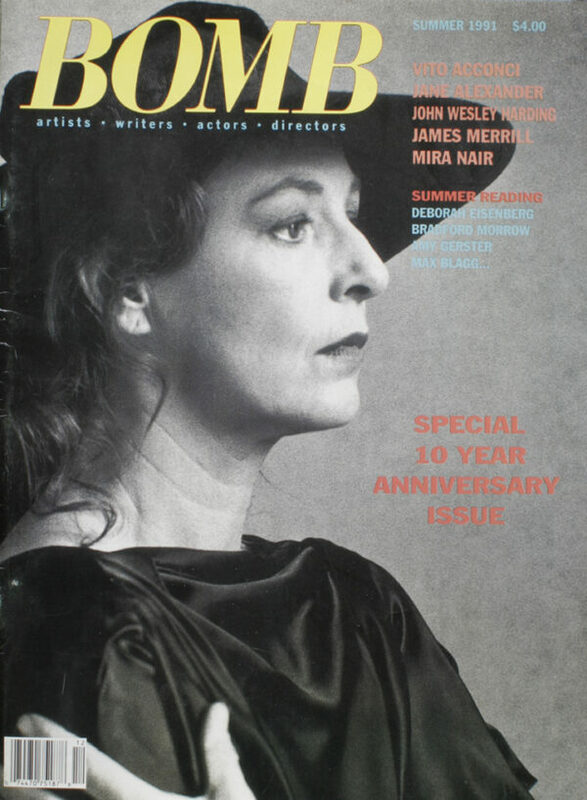 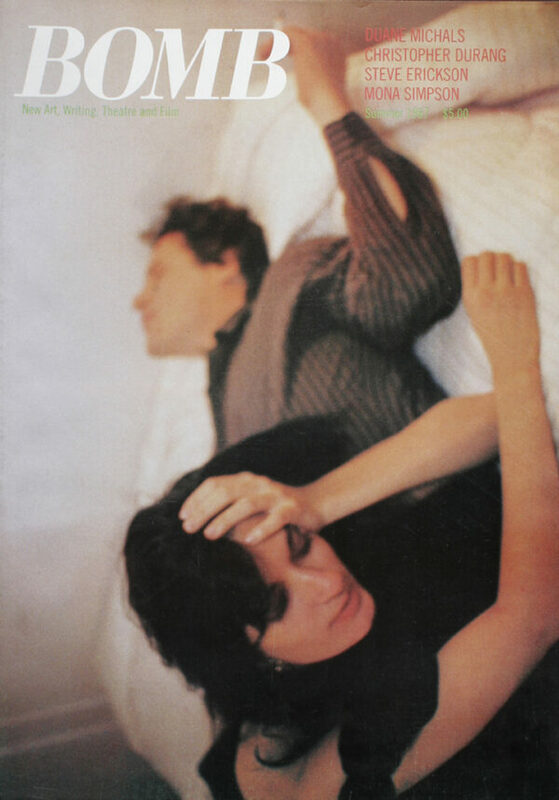 Featuring interviews with Kiki Smith, Arthur Miller, Steve Malkmus, Jayne Anne Phillips, Tom Noonan, Fiona Rae, John Edgar Wideman, Frank Pugliese, Diamanda Galas & John Paul Jones, and David Bowes. 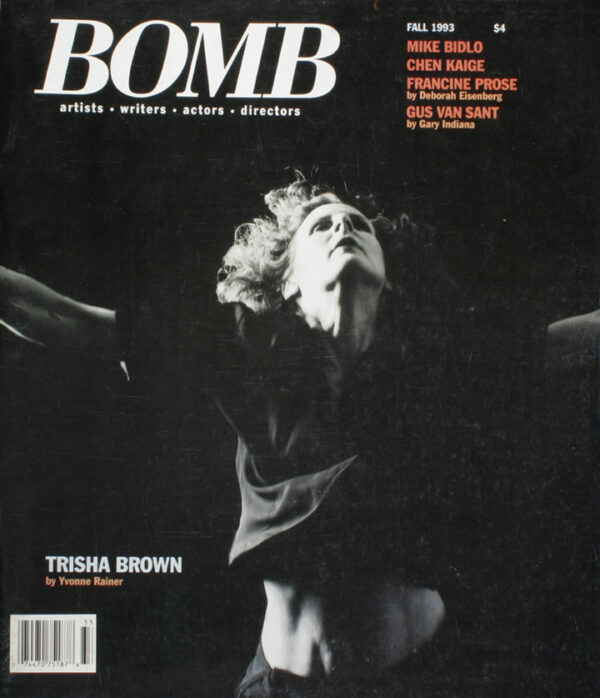 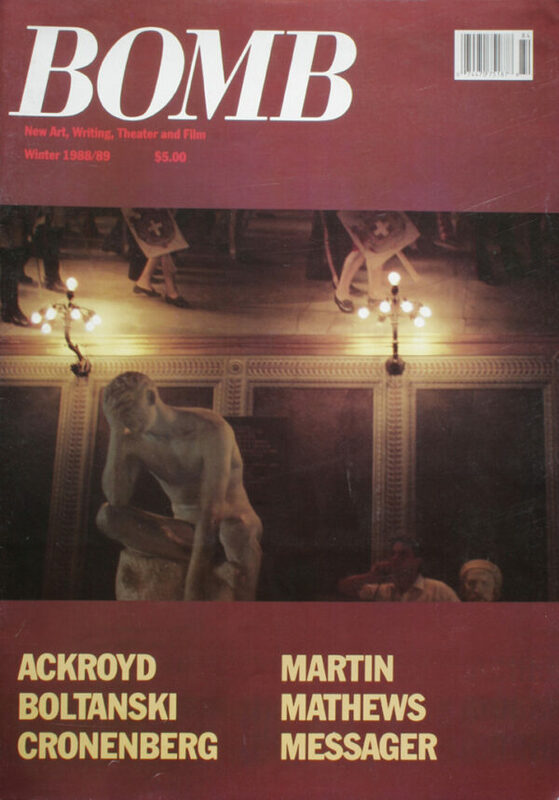 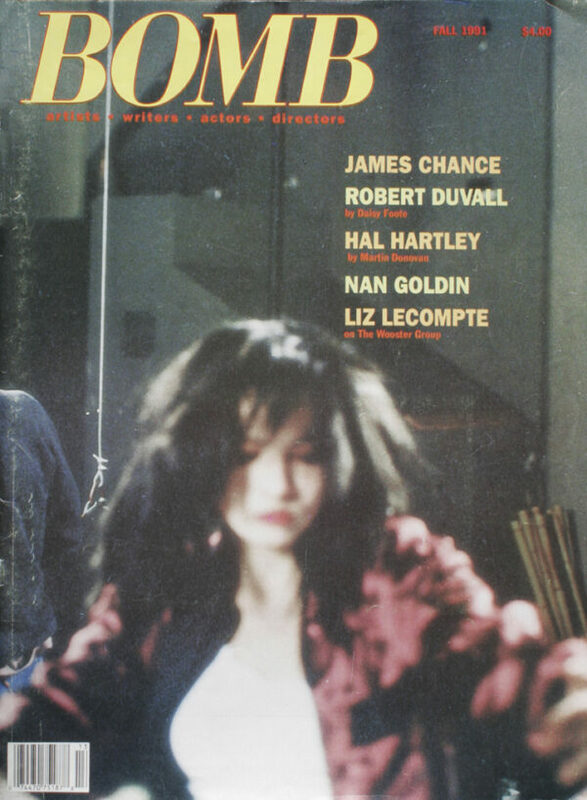 Featuring interviews with Gus Van Sant, Trisha Brown, Bernard Cooper, Francine Prose by Deborah Eisenberg, Mike Bidlo, Rob Weiss, Han Ong, Chen Kaige, Lawrence Chua, and Garry Lang. 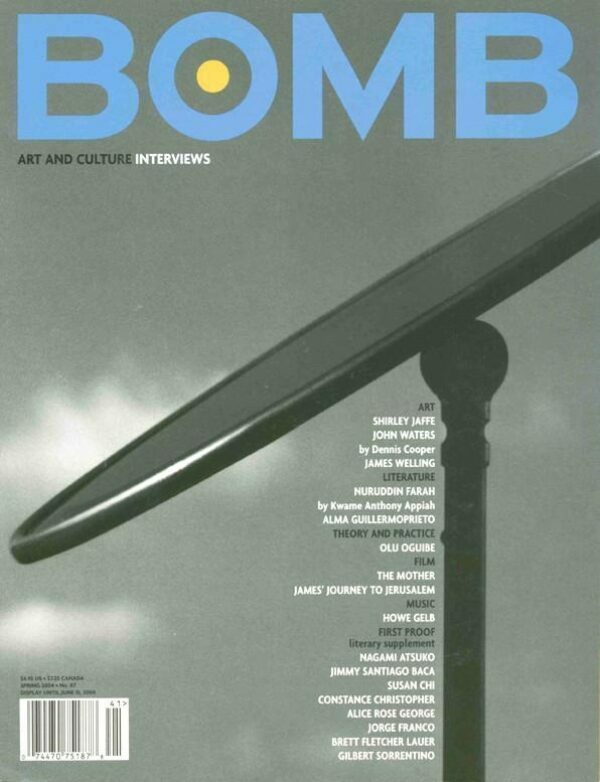 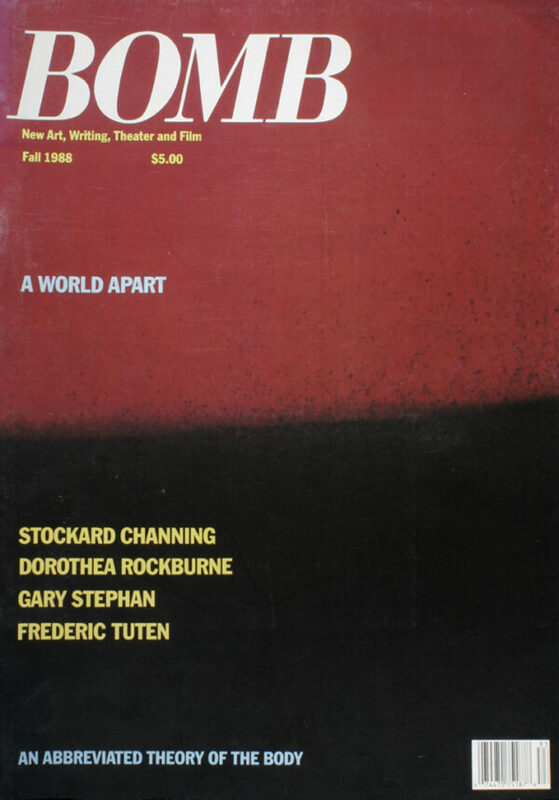 Featuring interviews with Richard Tuttle, Television, Anna Deveare Smith, Jessica Stockholder, YoYo, Donna Tartt, Gregg Araki, Ron Vawter, Lillian Lee, Fabian Marcaccio, and Robbie McCauley. 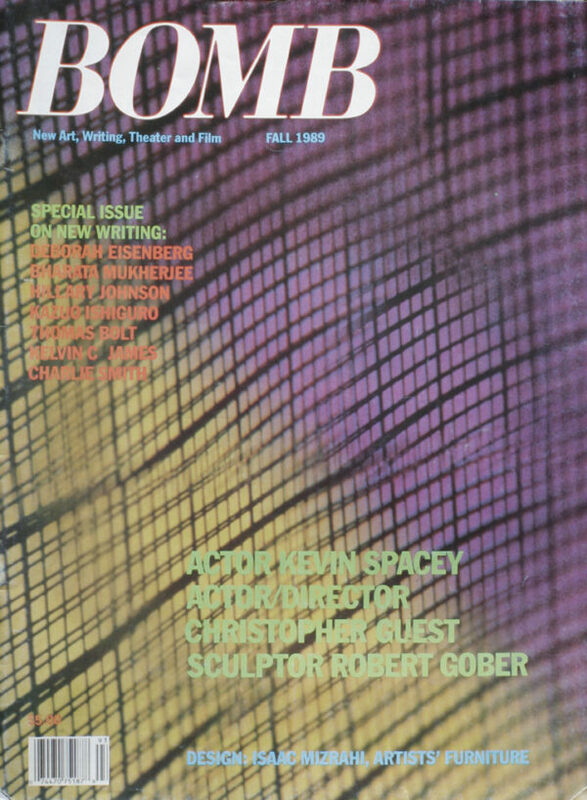 Featuring interviews with Kevin Spacey, Robert Gober, Deborah Eisenberg, Christopher Guest, Isaac Mizrahi, Kazuo Ishiguro, Marvin Heiferman, Bharati Mukherjee, John Heys, Maureen Conner, Hillary Johnson, and Ketan Mehta. 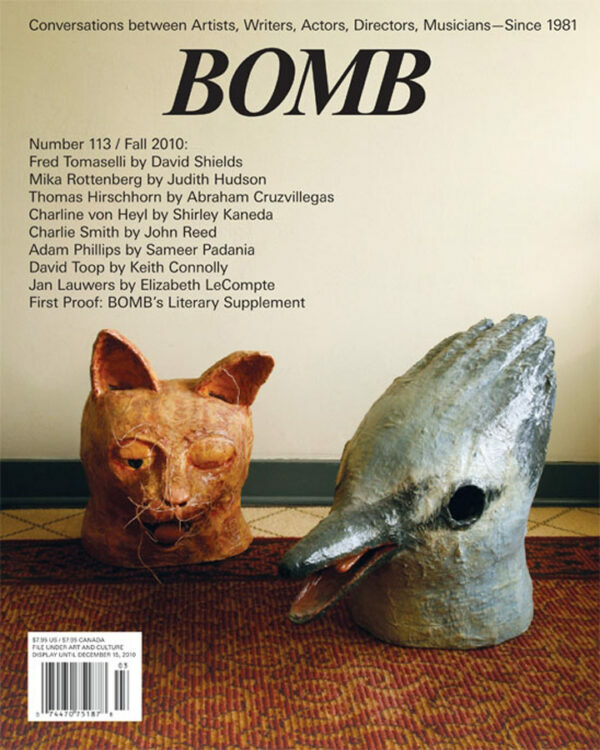 Salman Rushdie, Polly Apfelbaum, Dennis Cooper, James Nares, Penny Arcade, Mats, Alexander Kluge, Robert Greene, Nancy Shaver, Abbijane, Terry Kinney, Michael Tetherow, Bill Barrette, and Carmello Pomodoro. 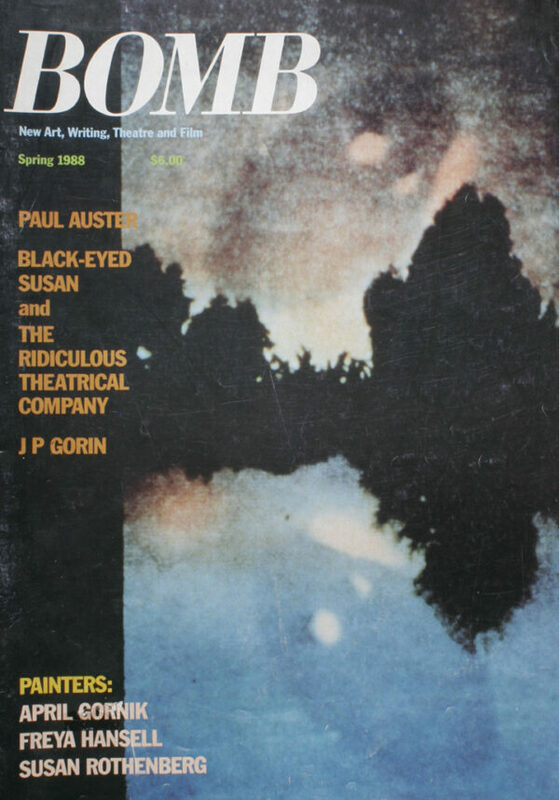 Paul Auster by Joseph Mallia, Black Eyed Susan, Jean Pierre Gorin, April Gornik, Freya Hansell & Susan Rothenberg. 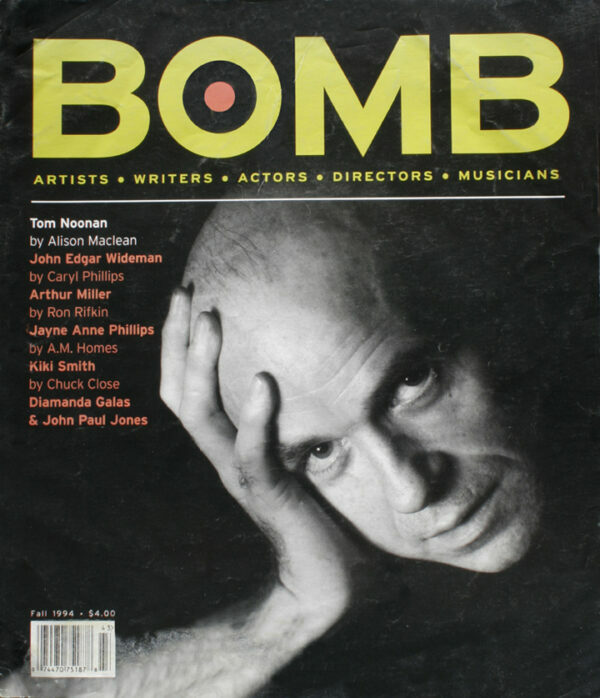 Christopher Durang, Duane Michals by David Seidner, Steve Erickson, Mona Simpson, and Weegee. 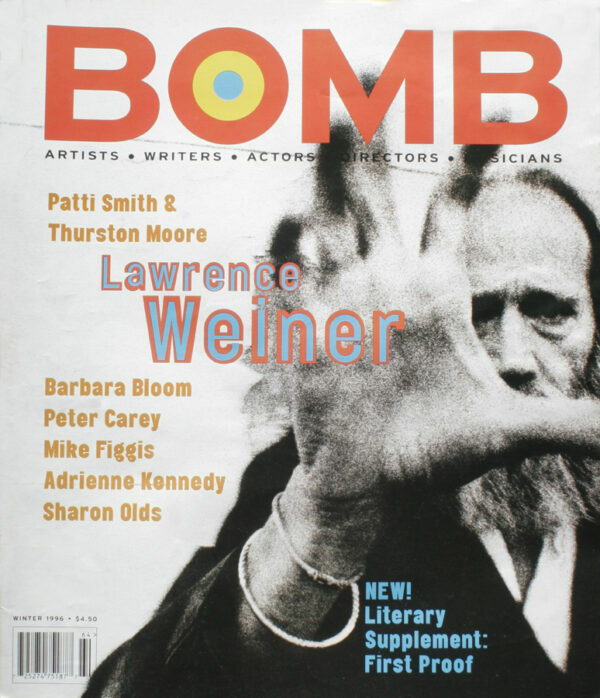 Willem Dafoe, Kathy Acker, Ross Bleckner, Janet Hobhouse, and St. EOM. 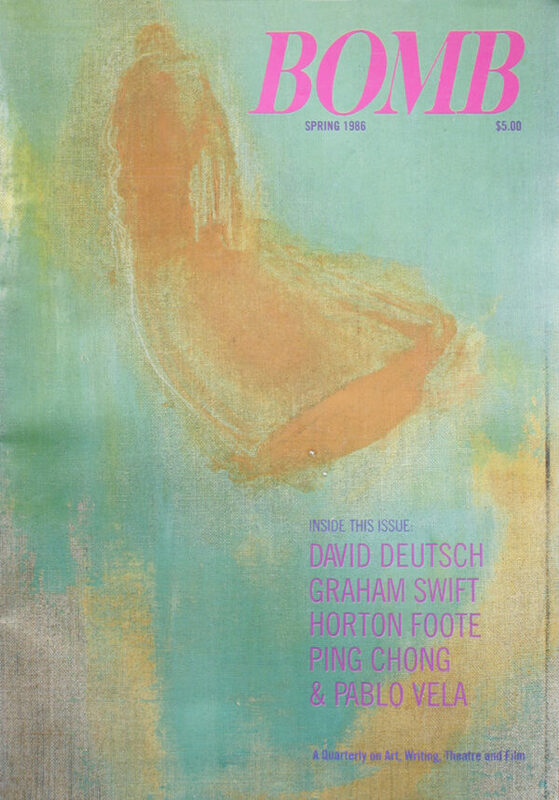 Graham Swift by Patrick McGrath, Horton Foote, Ping Chong & Pablo Vela, and David Deutsch. 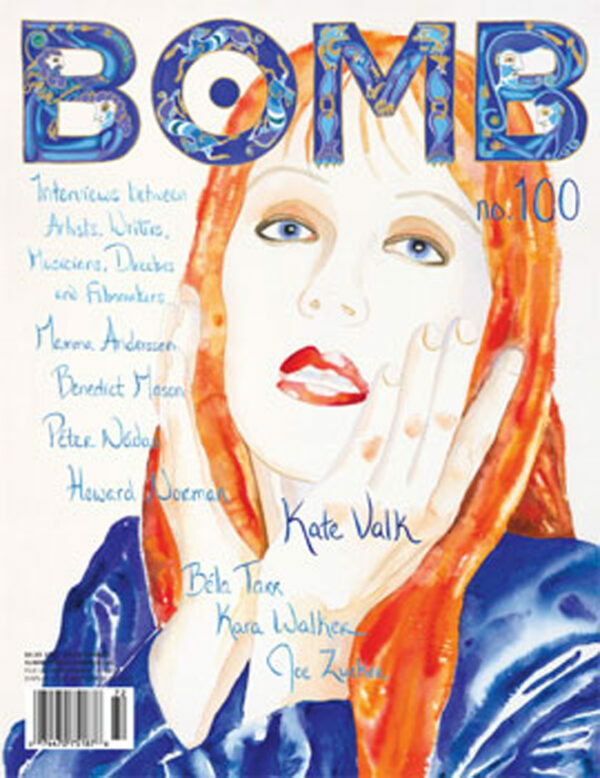 Roy Lichtenstein by April Bernard & Mimi Thompson, Jackie Winsor, art by Sarah Charlesworth, Francesco Clemente, and more. 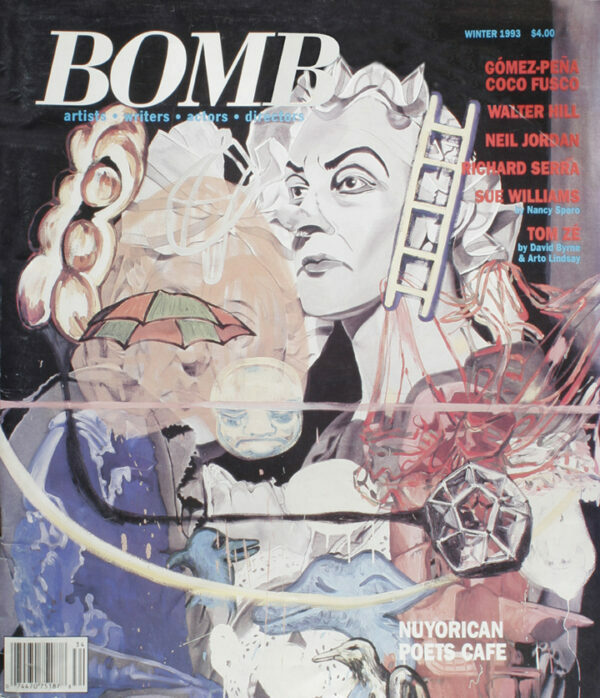 David Salle by Georgia Marsh, John Huston, Richard Chaves & Vincent Caristi, art by Carroll Dunham, Moira Dryer, and more. 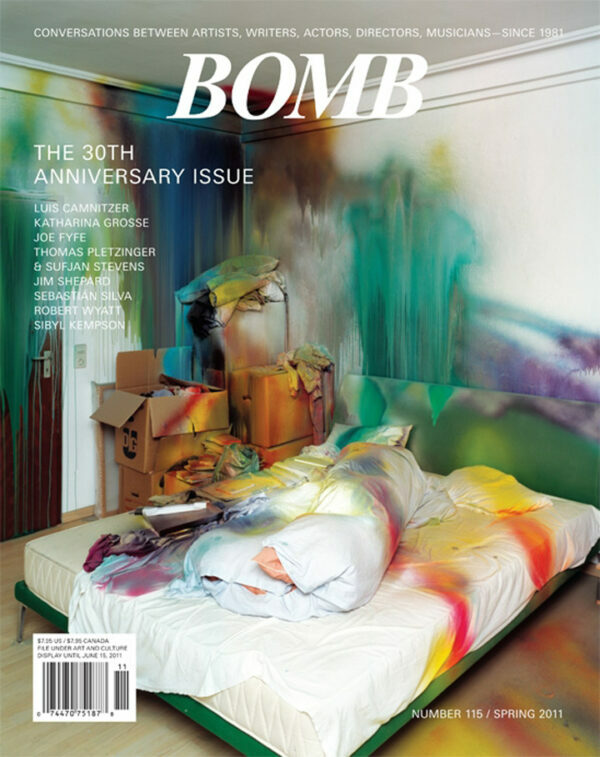 María Irene Fornés, Jeff Weiss, art by Cindy Sherman, Billy Sullivan, Robert Gober, Laurie Simmons, and more. 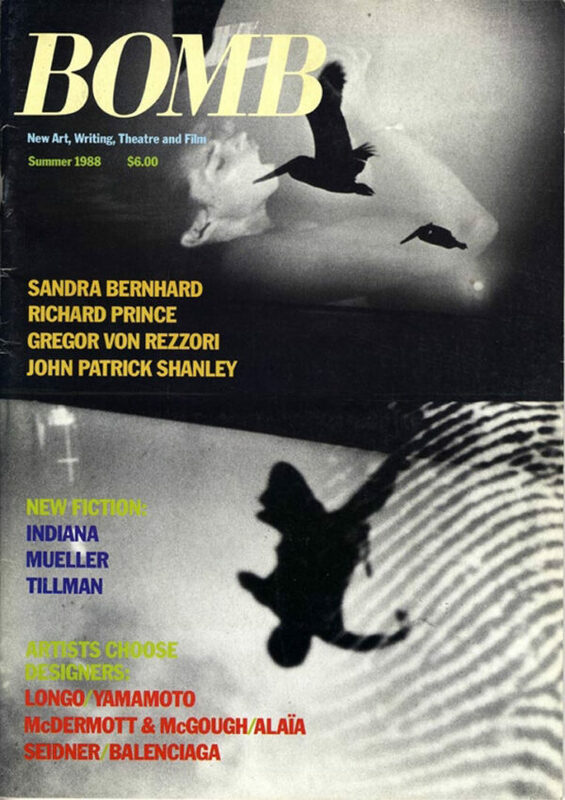 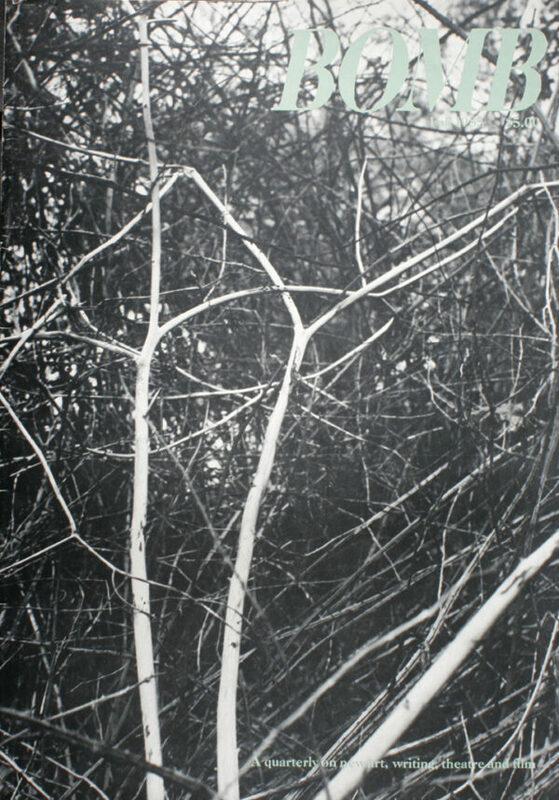 Betsy Sussler by Craig Gholson, Carl Apfelschnitt by Sarah Charlesworth, Michael McClard by Kathy Acker, Eric Mitchell, Becky Johnston, and Amos Poe. 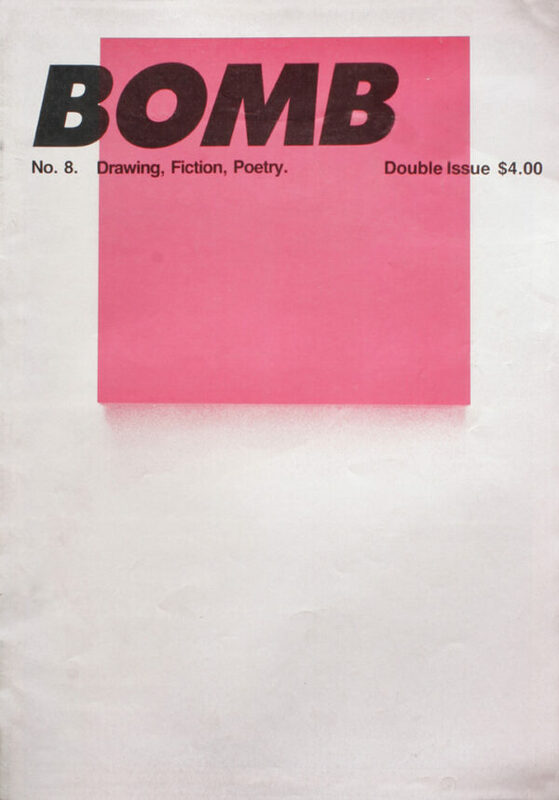 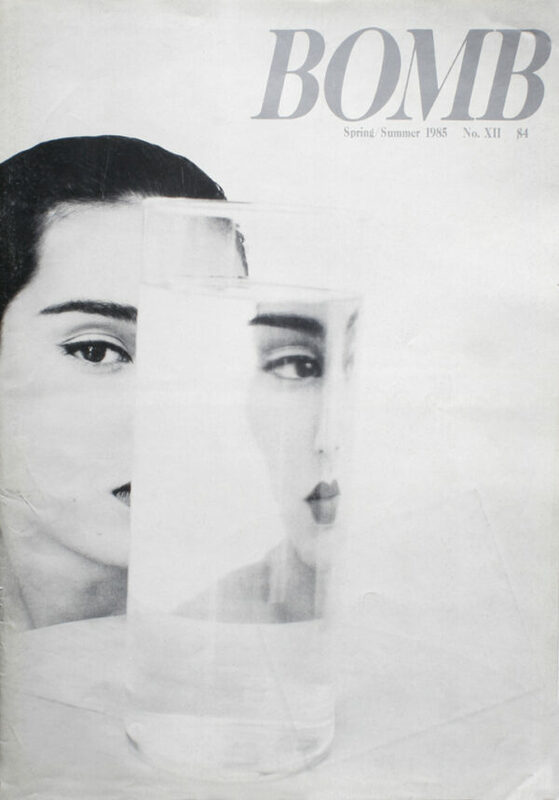 Cover design by Sarah Charlesworth.